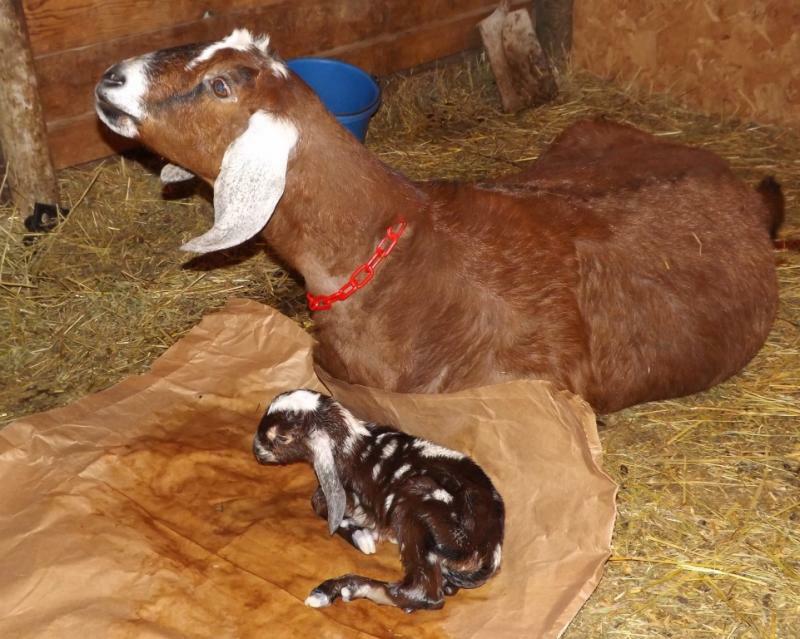 RASPBERRY KIDDED ON TIME IN 150 DAYS AT 4:18 P.M. TUESDAY, FEBRUARY 11TH., 2014 WITH TWINS. 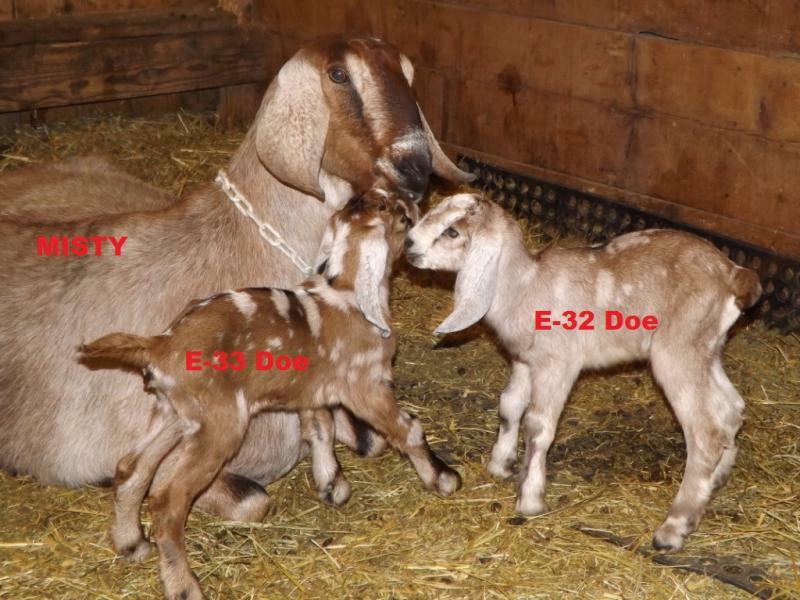 E-1, THE BUCK IS THE ONE WITH THE WHITE CROWN, and SISTER (SECOND BORN) E-2, IS BEING LICKED IN THE PROCESS OF EXCHANGING DIGESTIVE MICROBES. 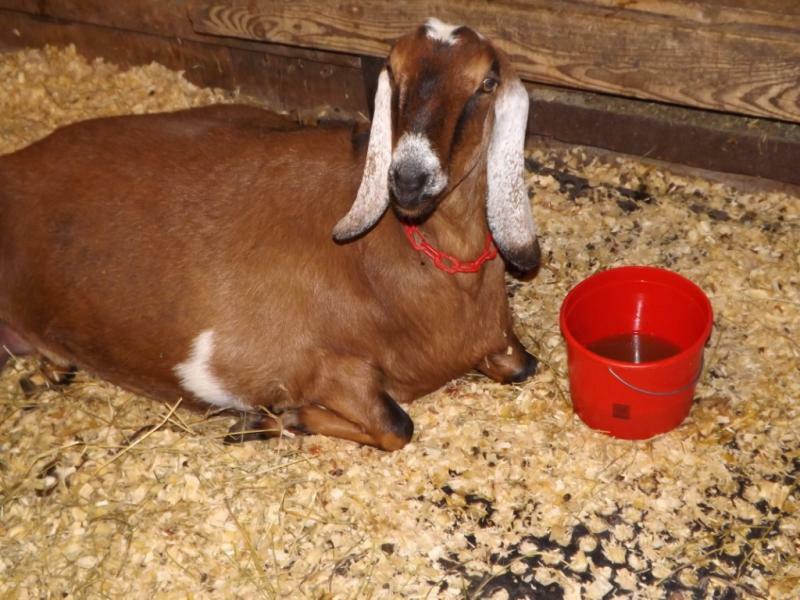 GIVEN A BUCKET OF WARM MOLASSES WATER FOR A JOB WELL DONE. 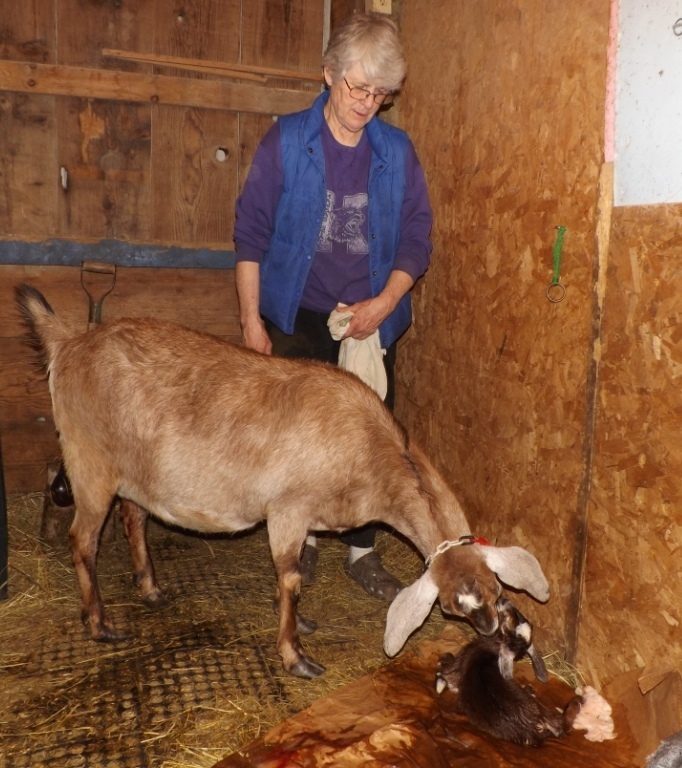 ALONG WITH HER MOLASSES WATER, MITZVAH GETS PEANUTS IN THE HULL FOR A JOB WELL DONE. 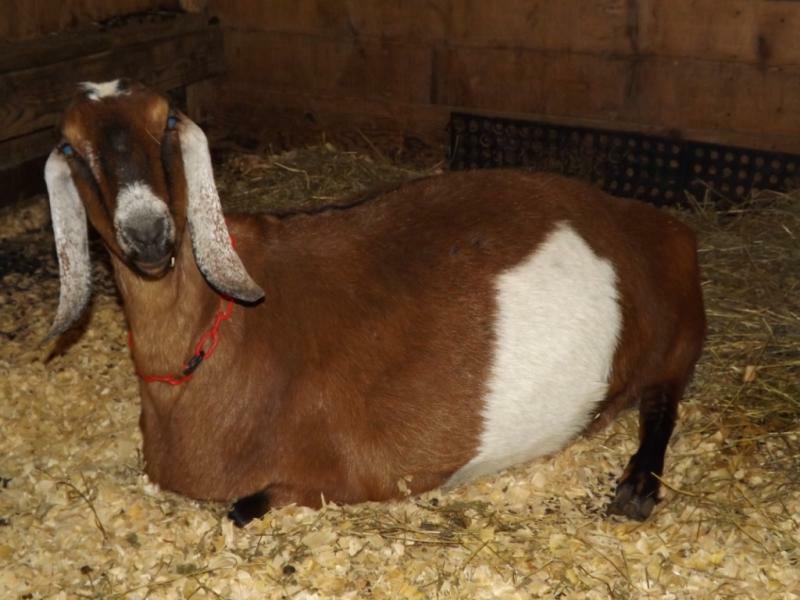 MITZVAH IS TAKING A WELL EARNED REST AFTER GIVING BIRTH TO QUAD DOES. 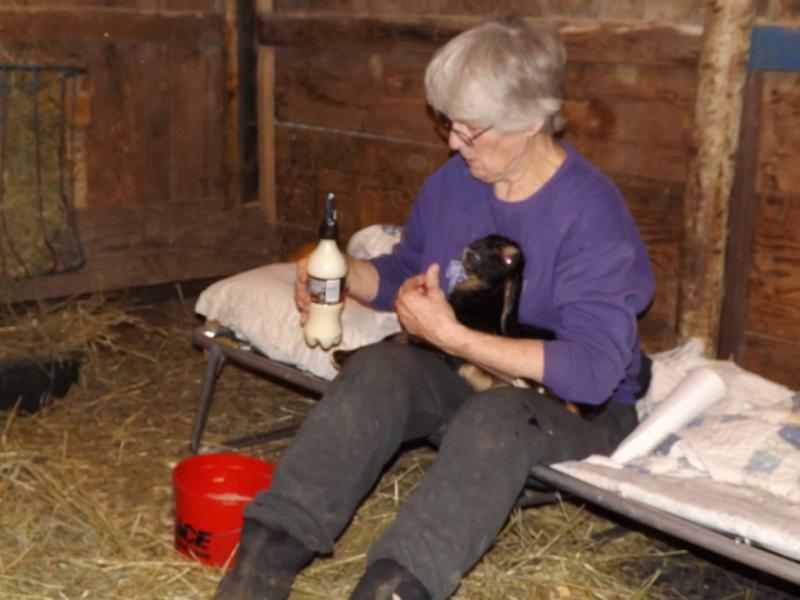 SUE IS GIVING HER SOME TREATS, PEANUTS IN THE HULL. 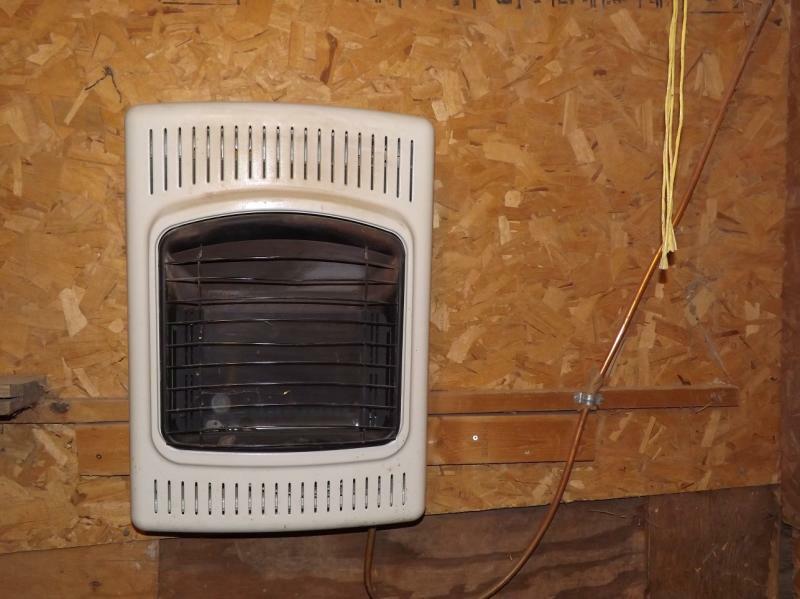 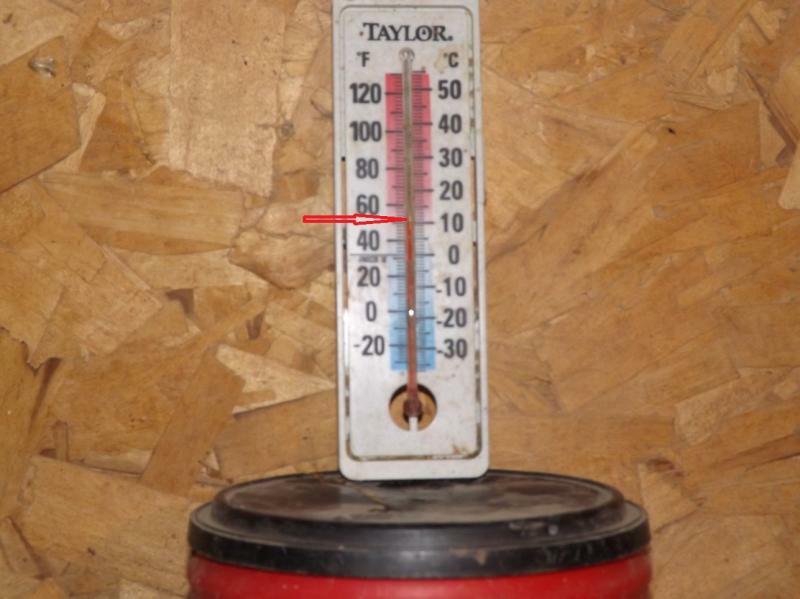 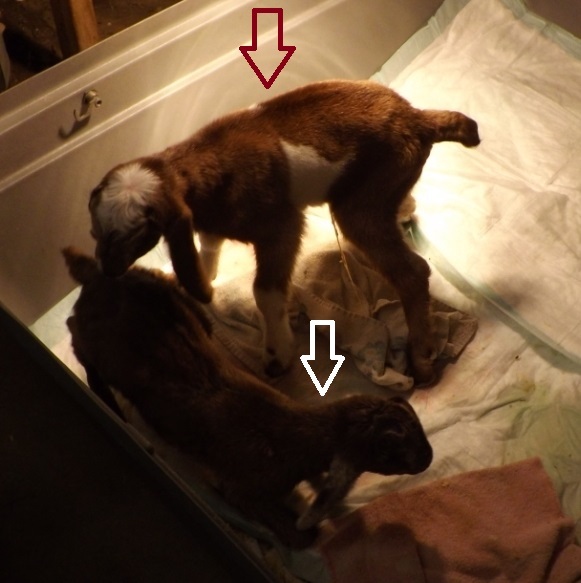 kidded at 7:00 a.m. - 9:00 a.m. 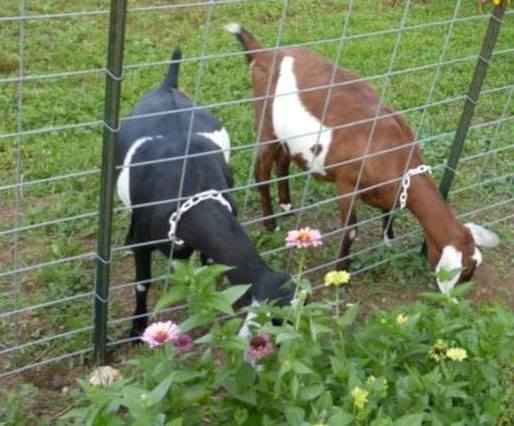 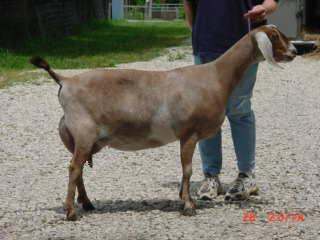 THE ENTIRE HERD IS G6S NORMAL BY DNA OR PARENTAGE. 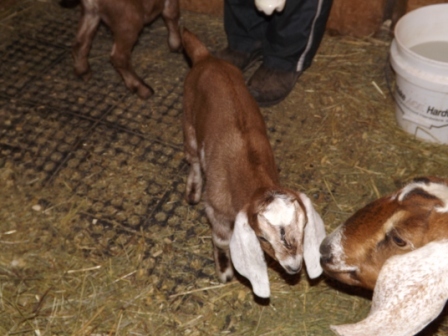 ALL KIDS ARE ON A COCCIDIA PREVENTIVE PROGRAM AND DEWORMED EVERY TWO WEEKS BEGINNING THE THIRD WEEK OF AGE. 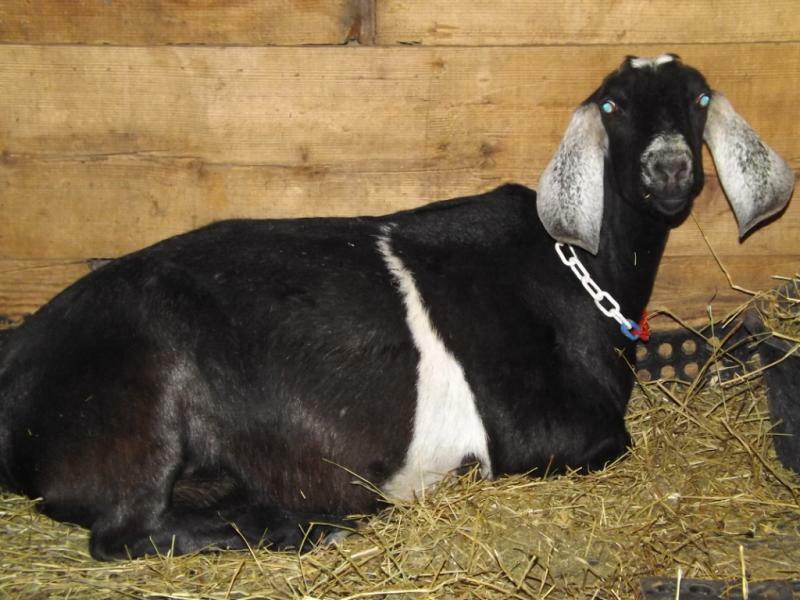 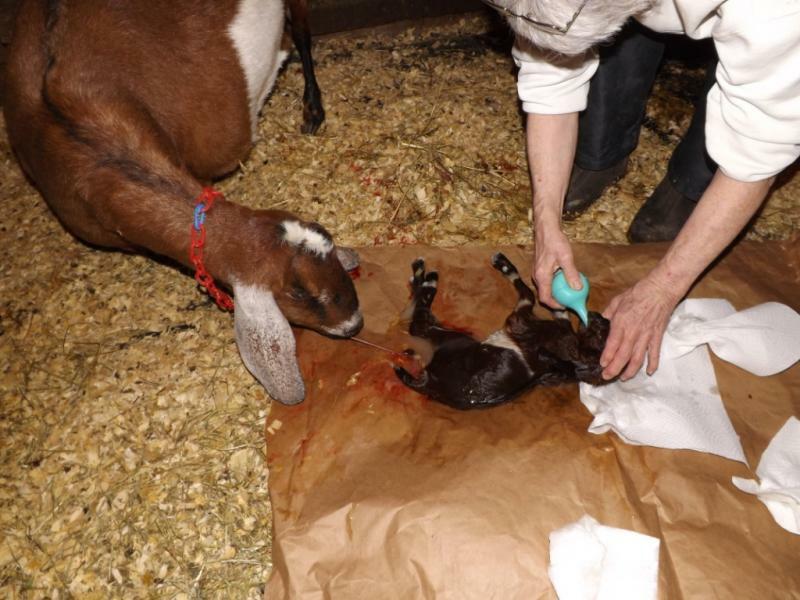 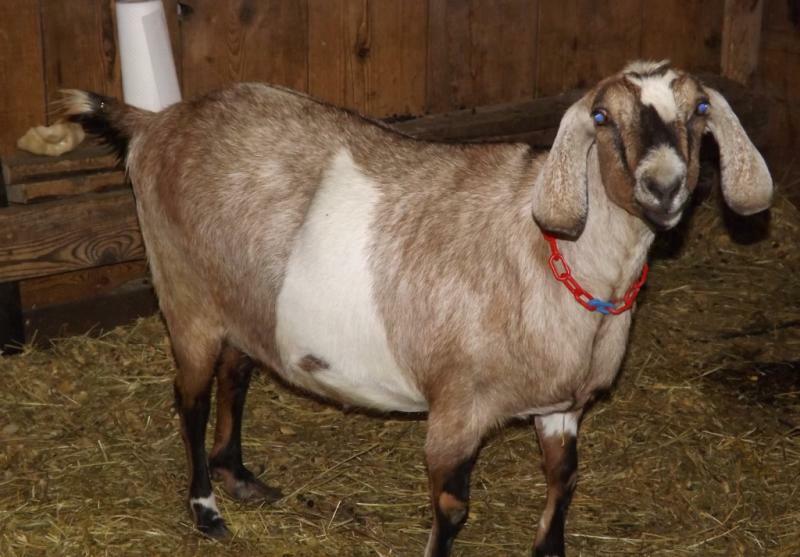 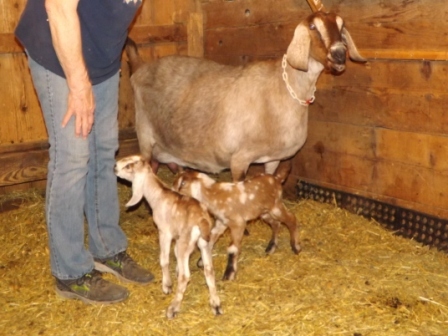 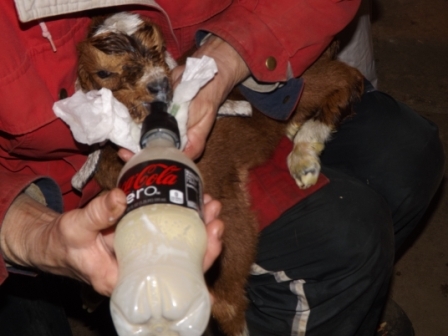 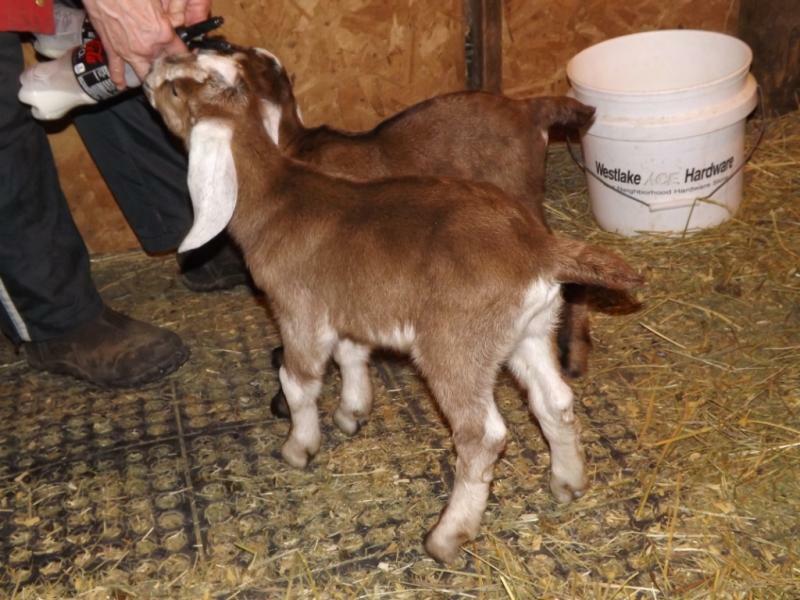 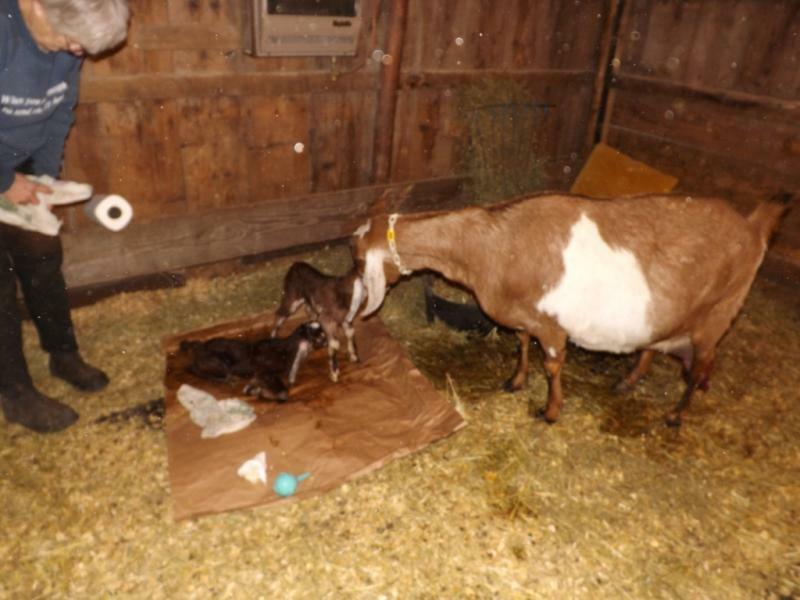 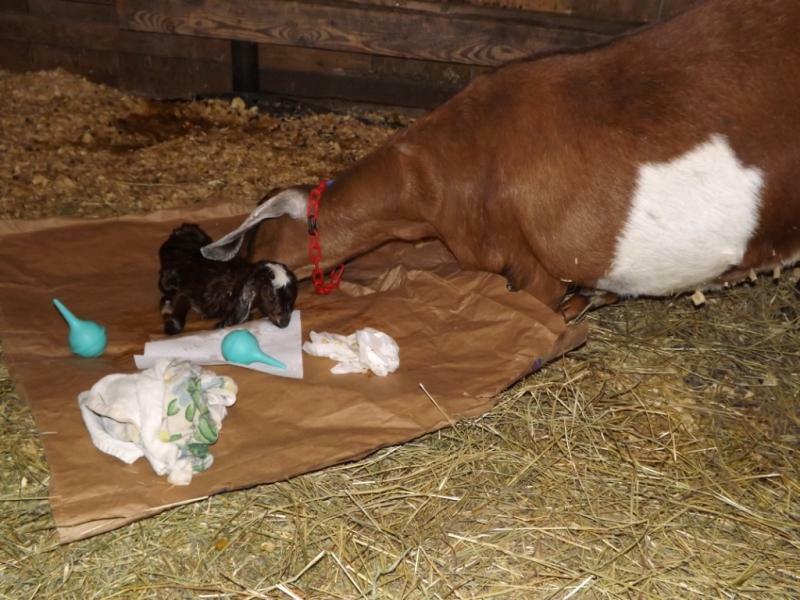 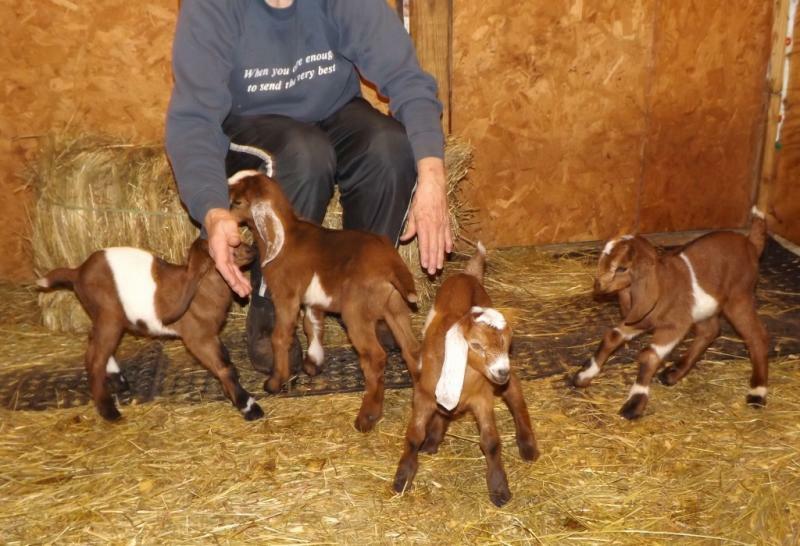 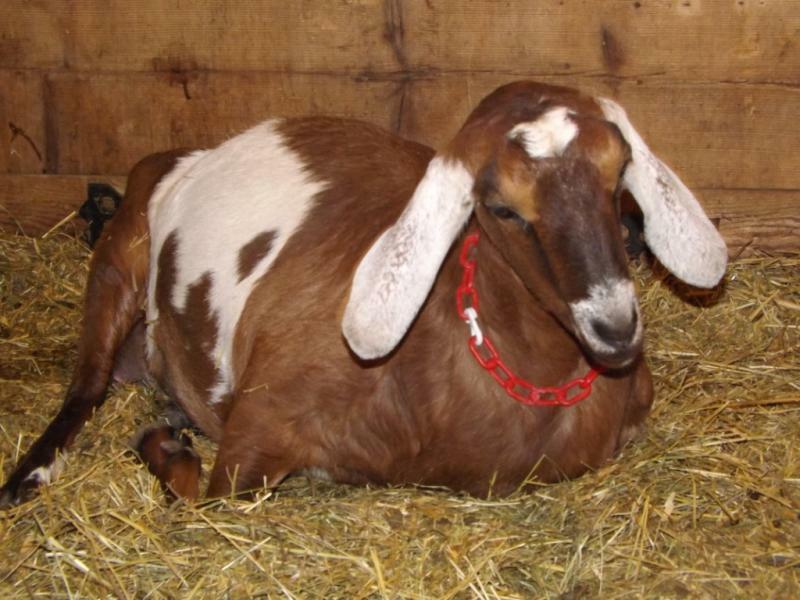 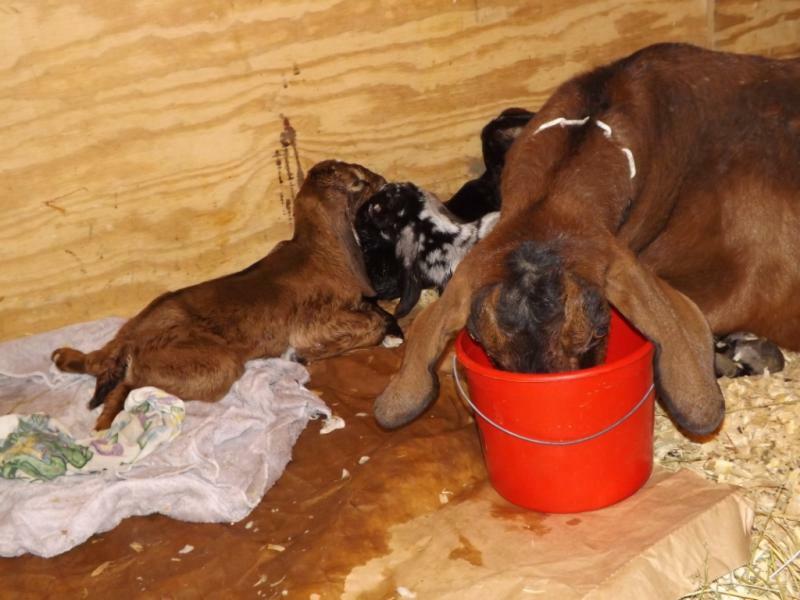 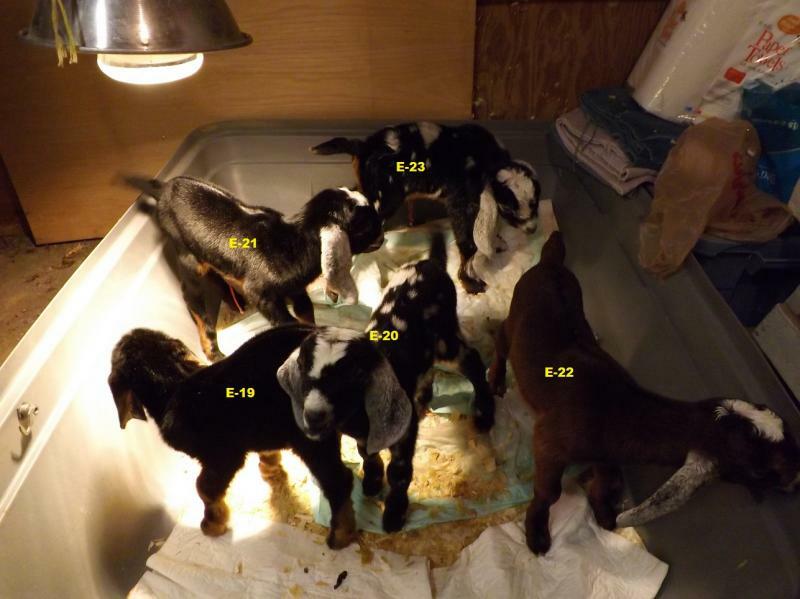 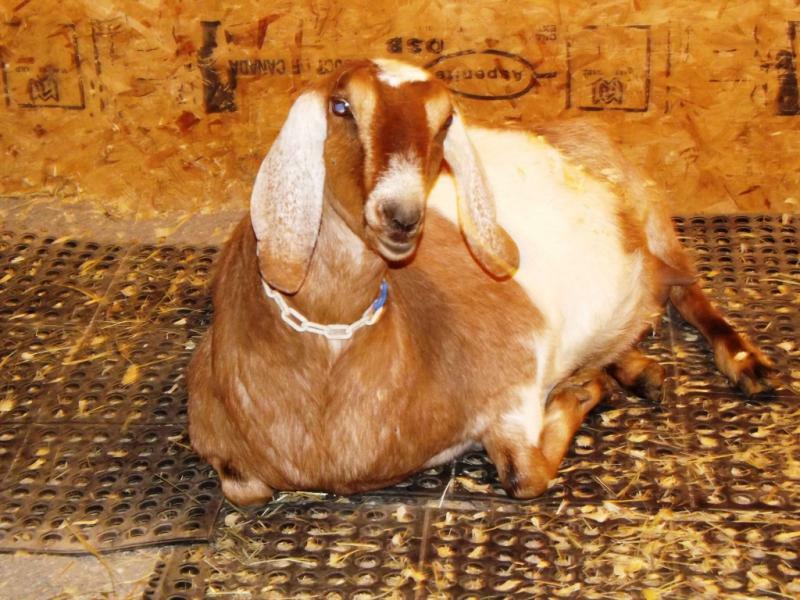 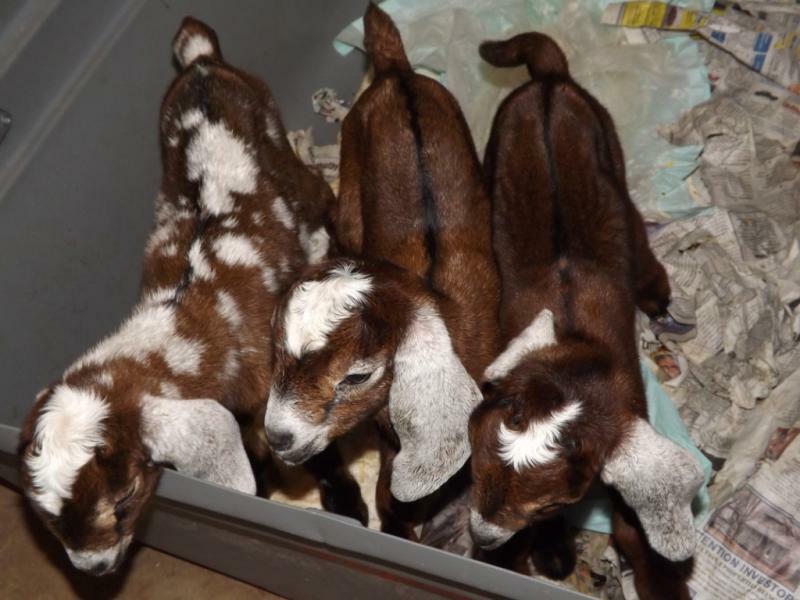 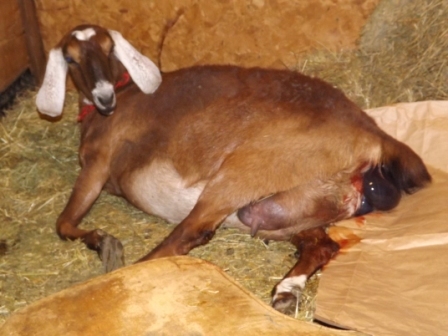 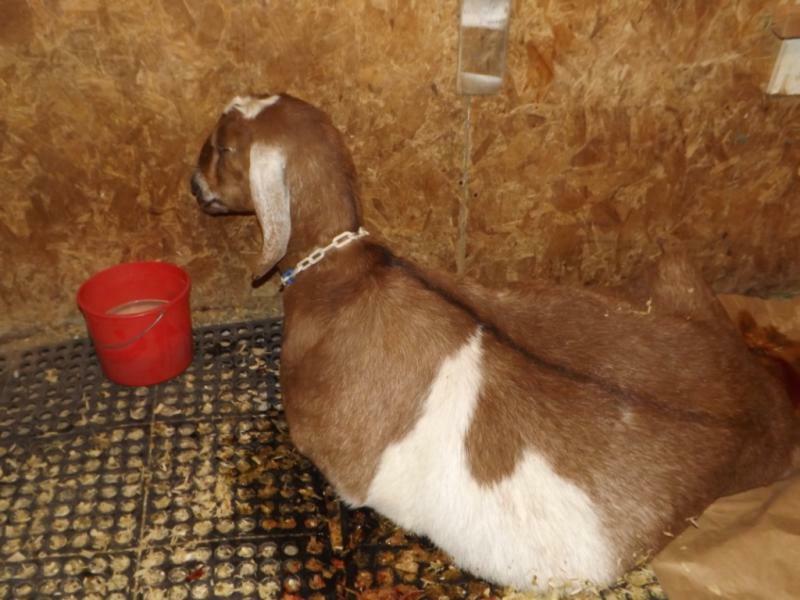 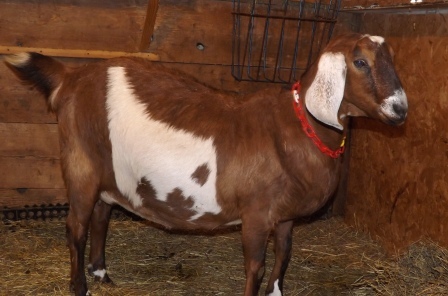 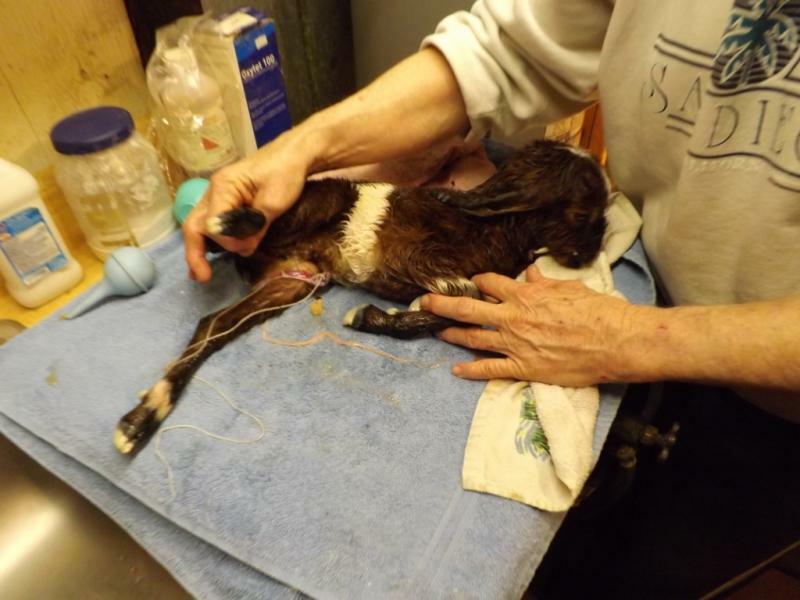 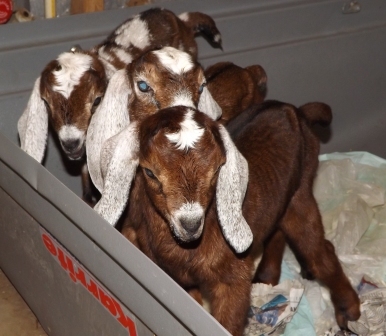 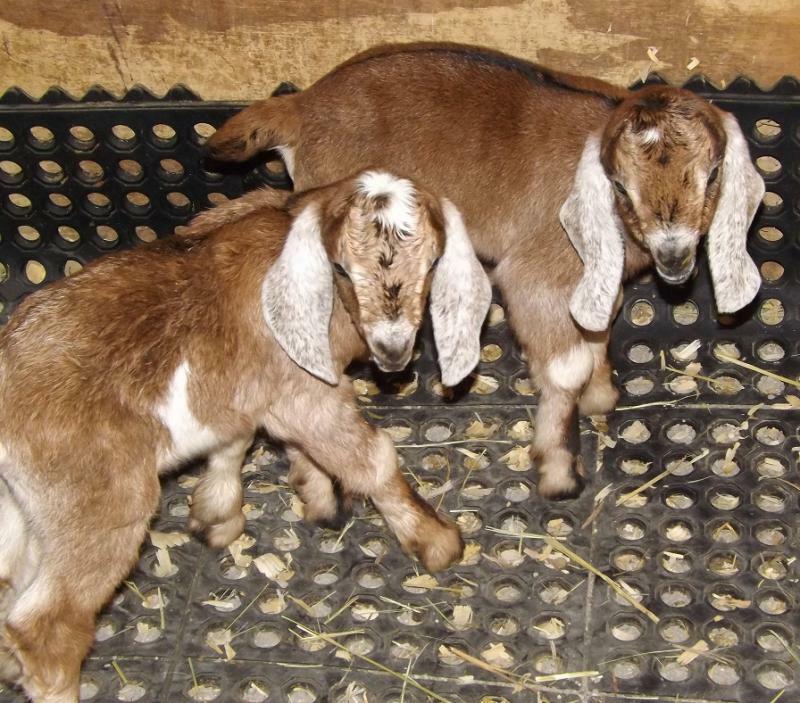 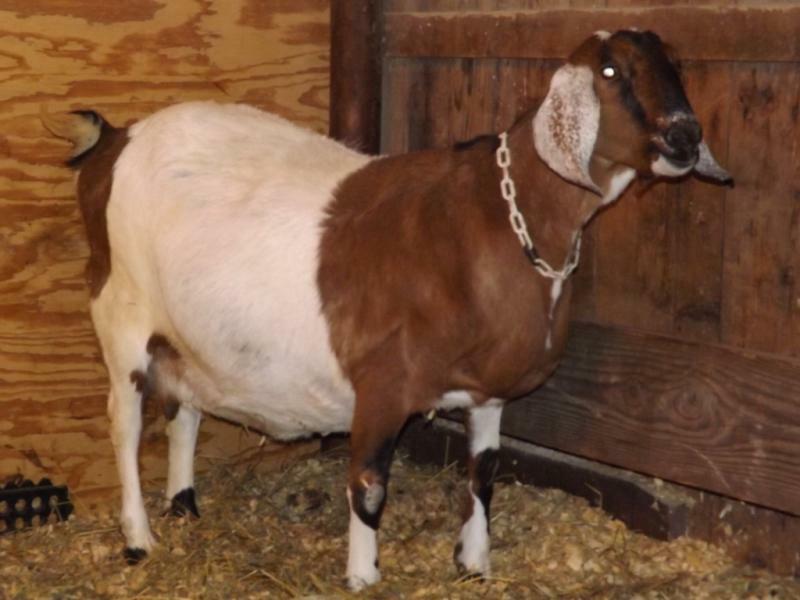 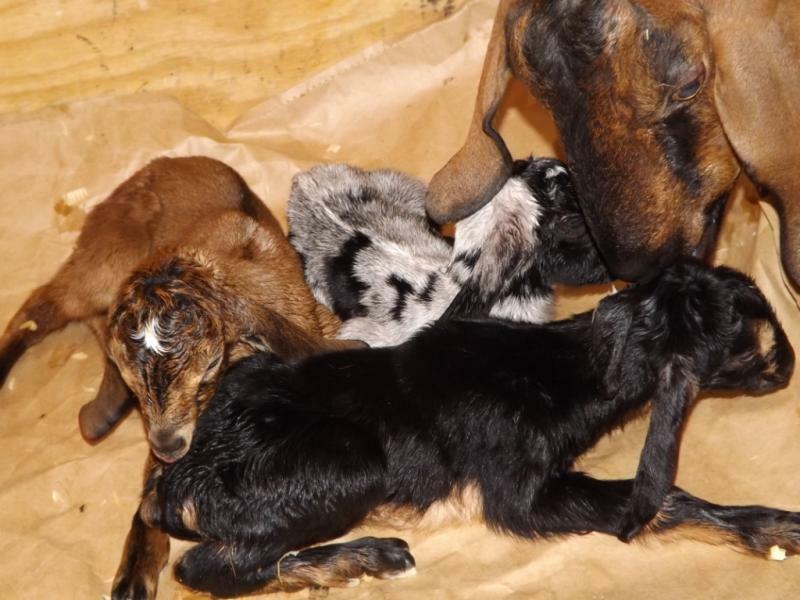 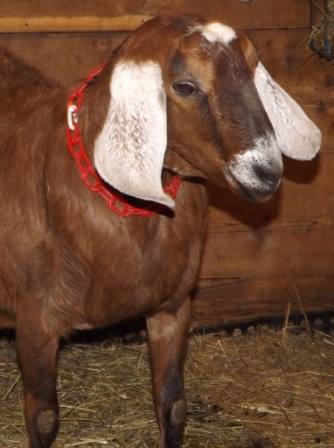 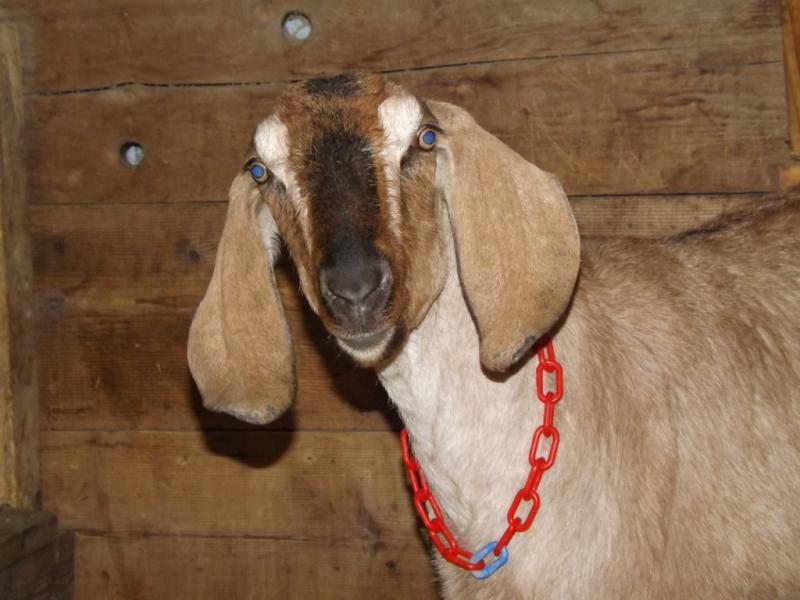 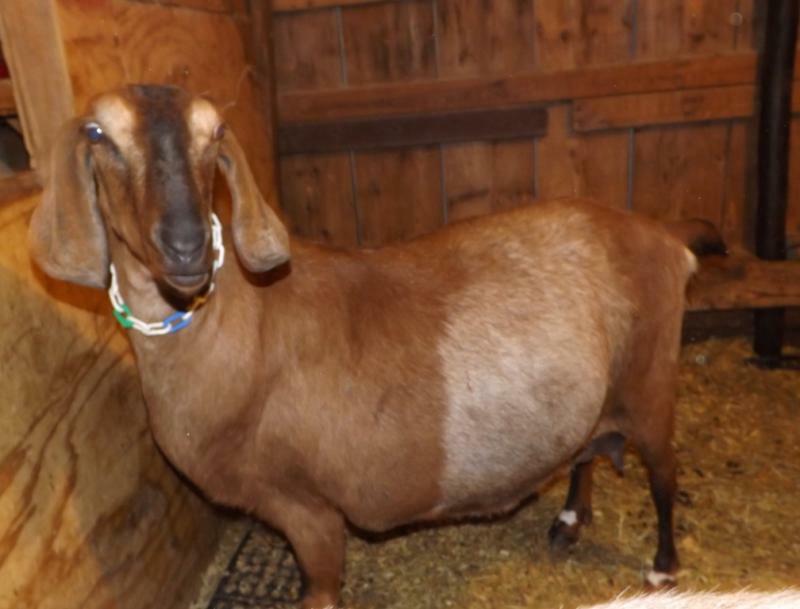 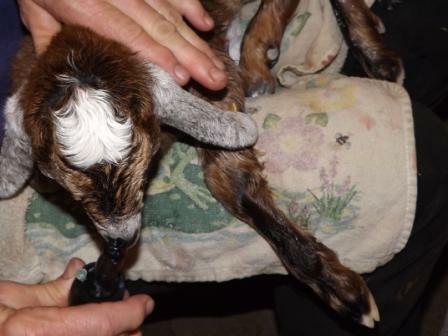 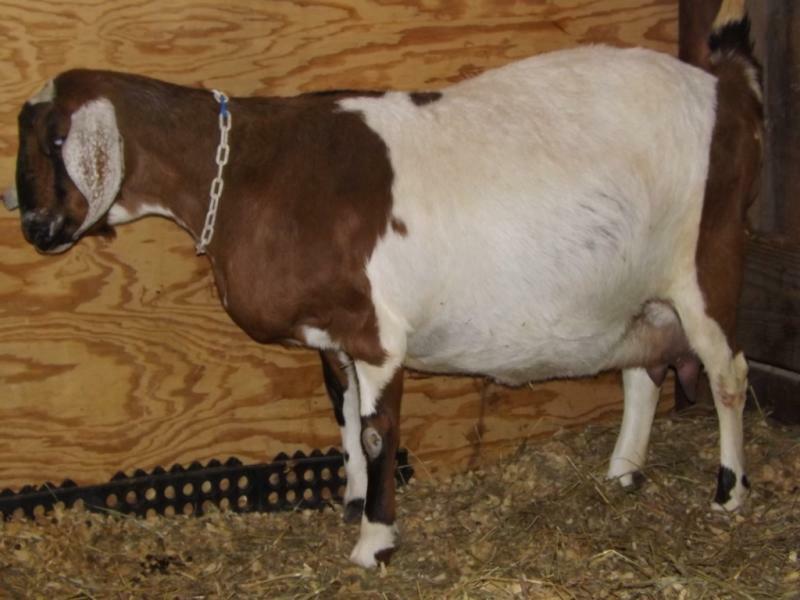 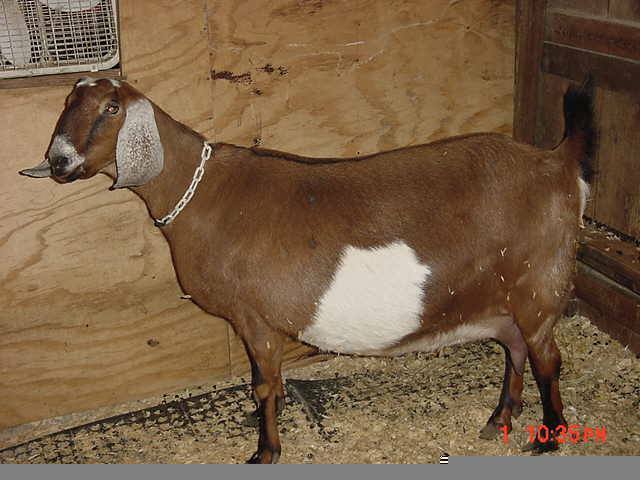 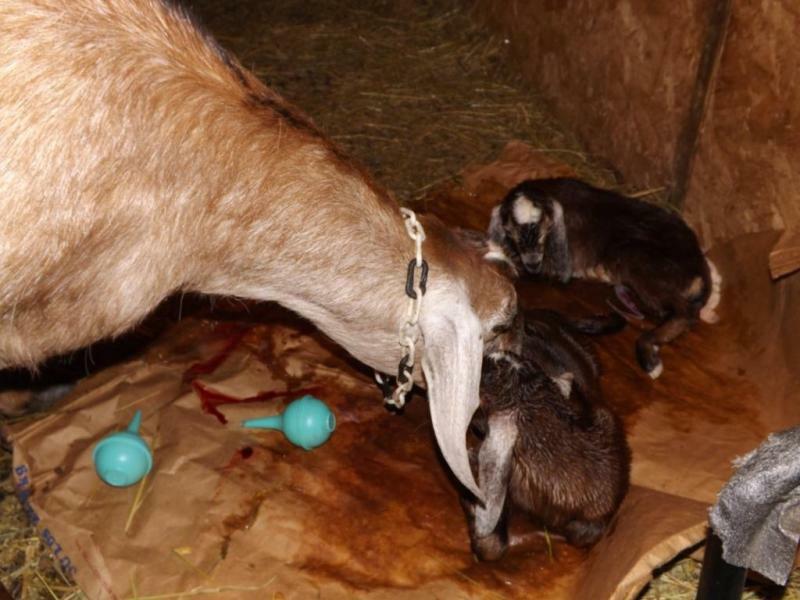 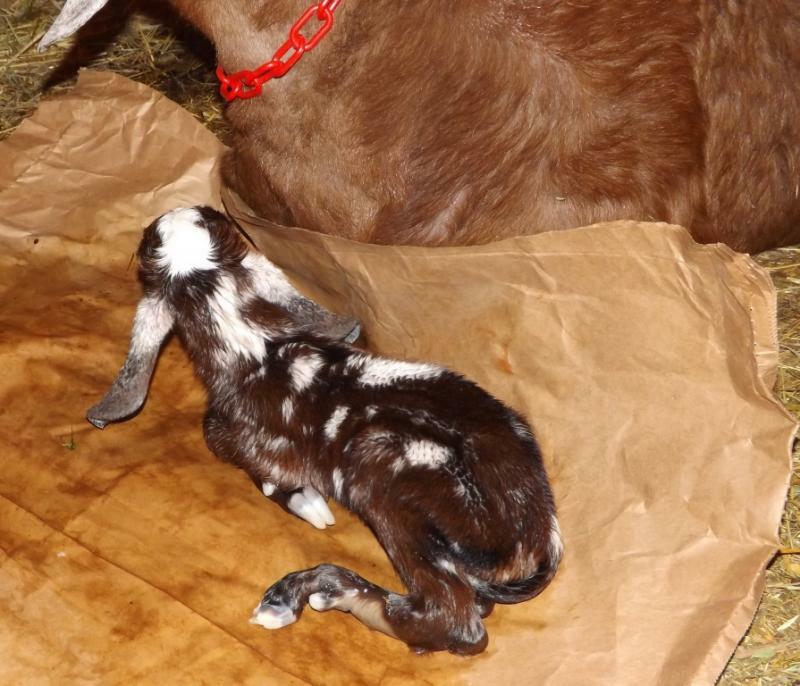 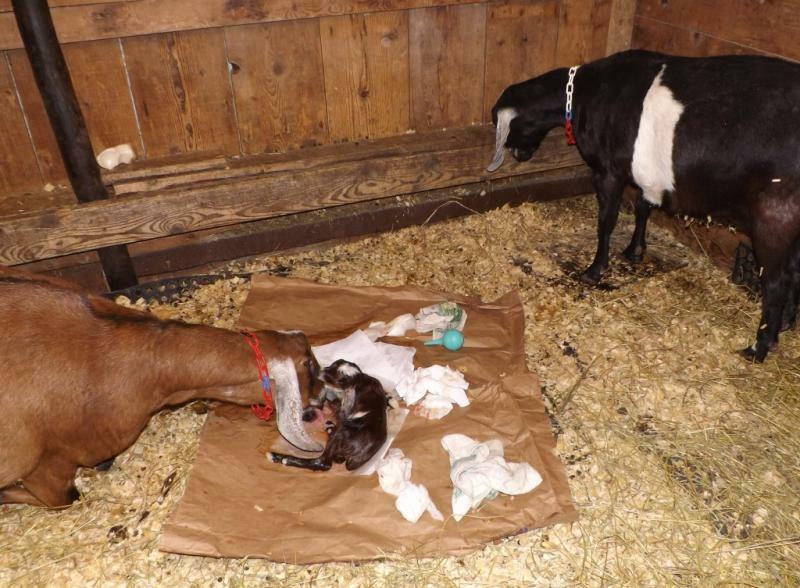 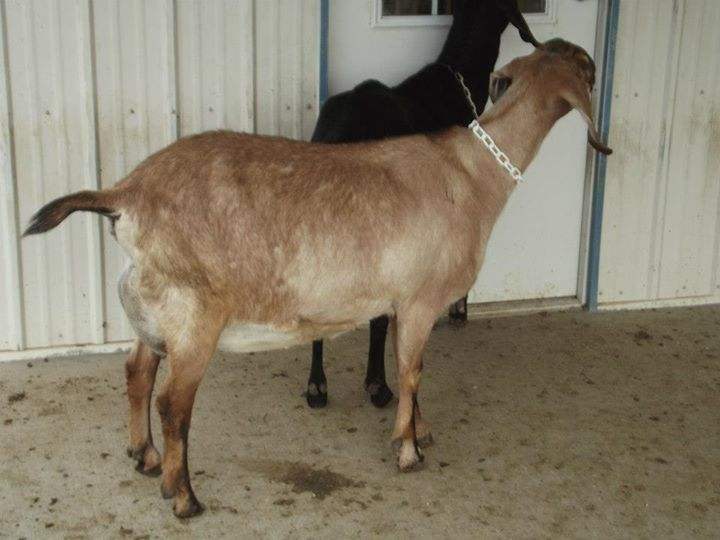 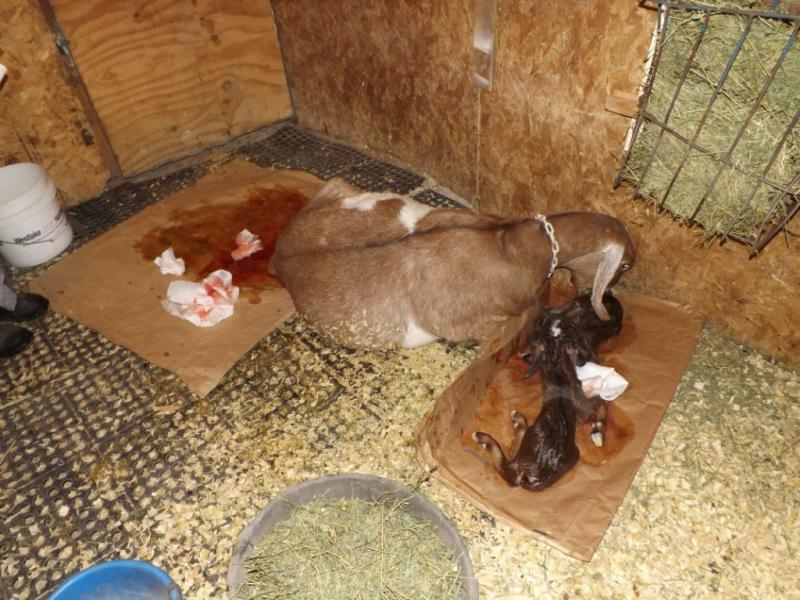 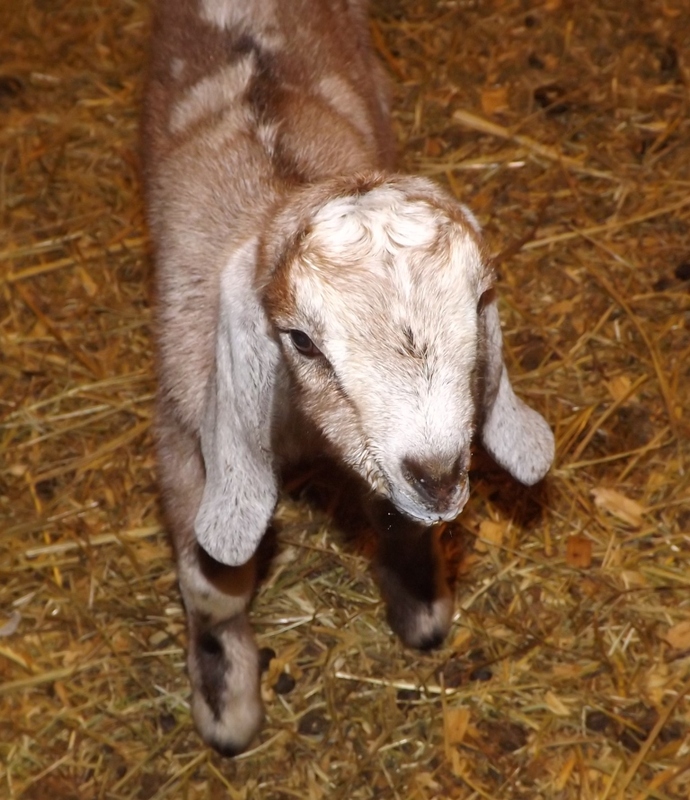 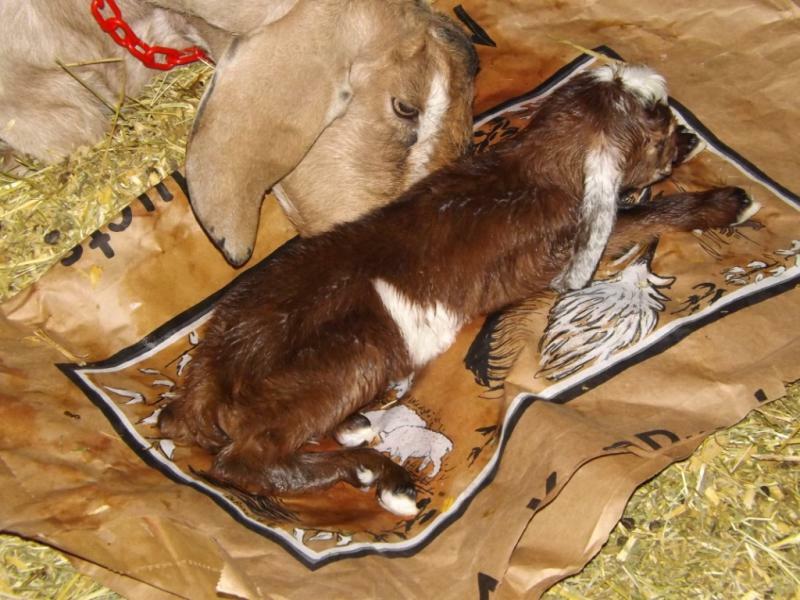 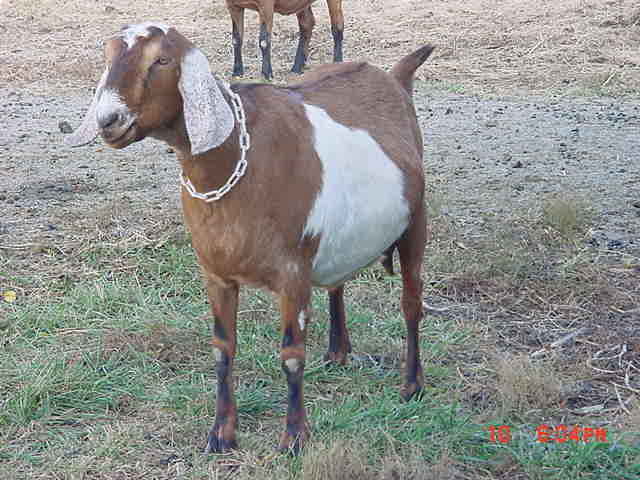 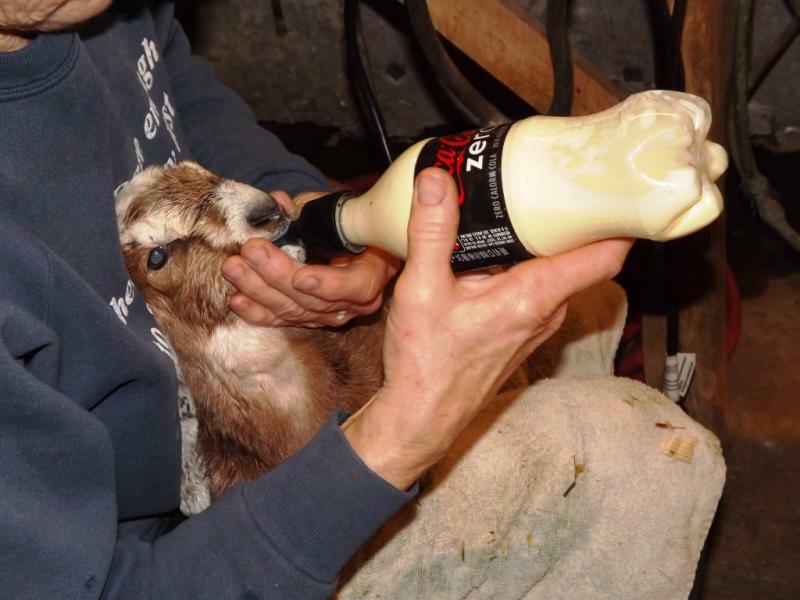 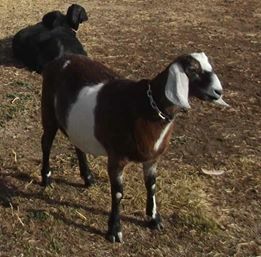 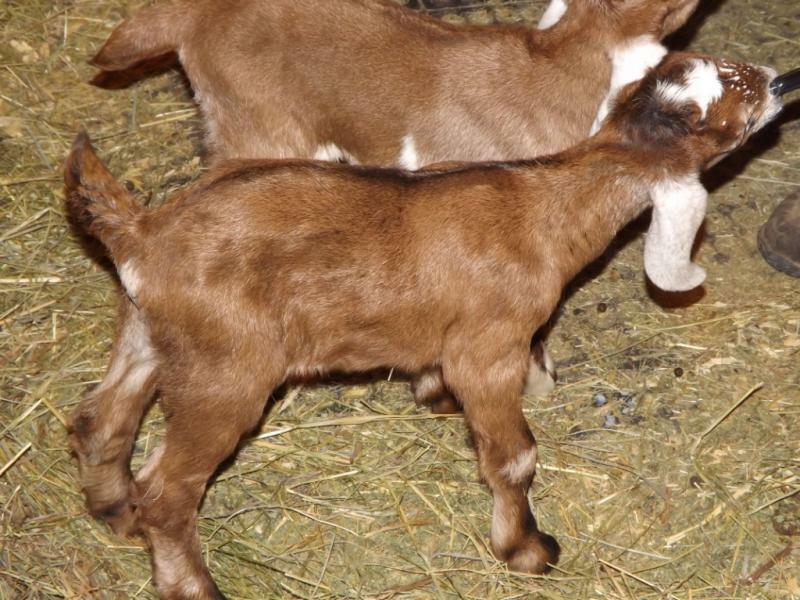 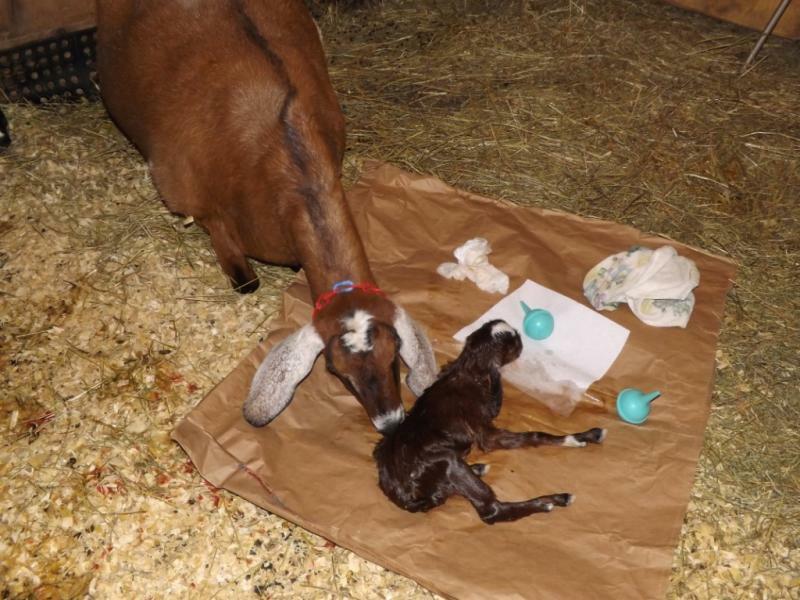 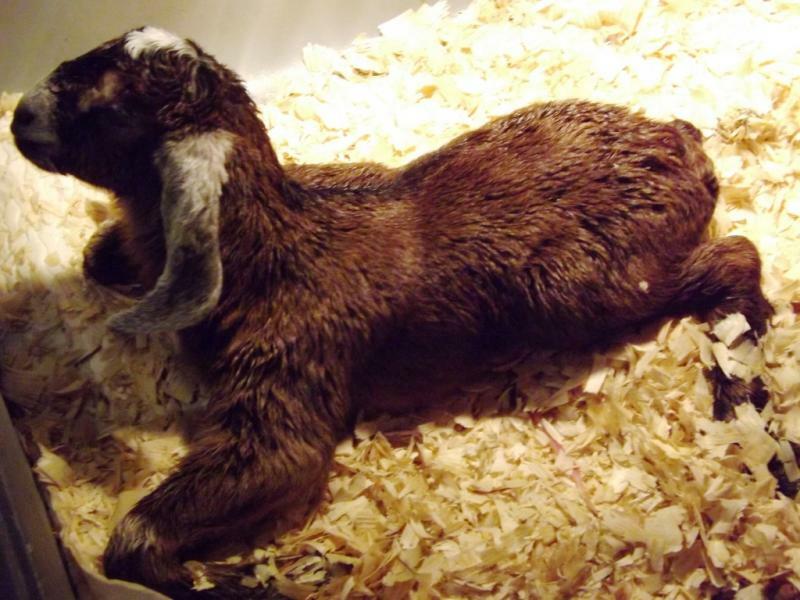 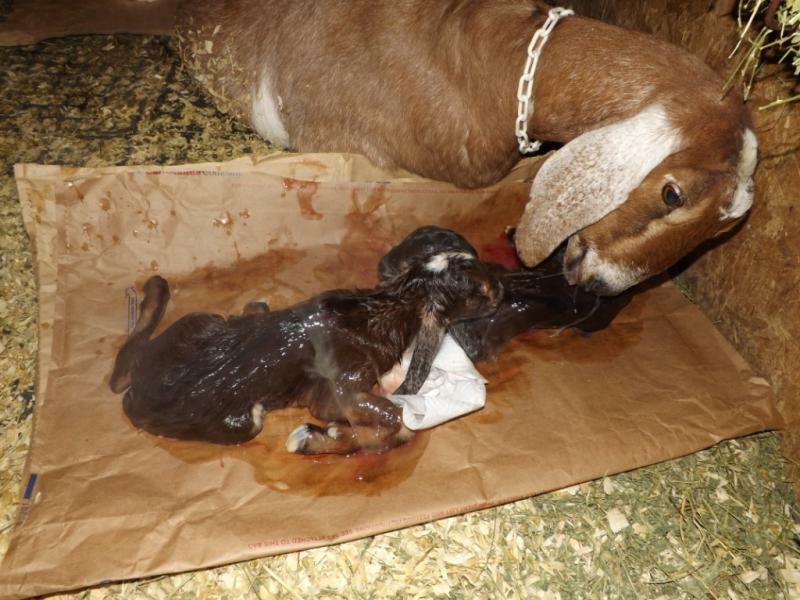 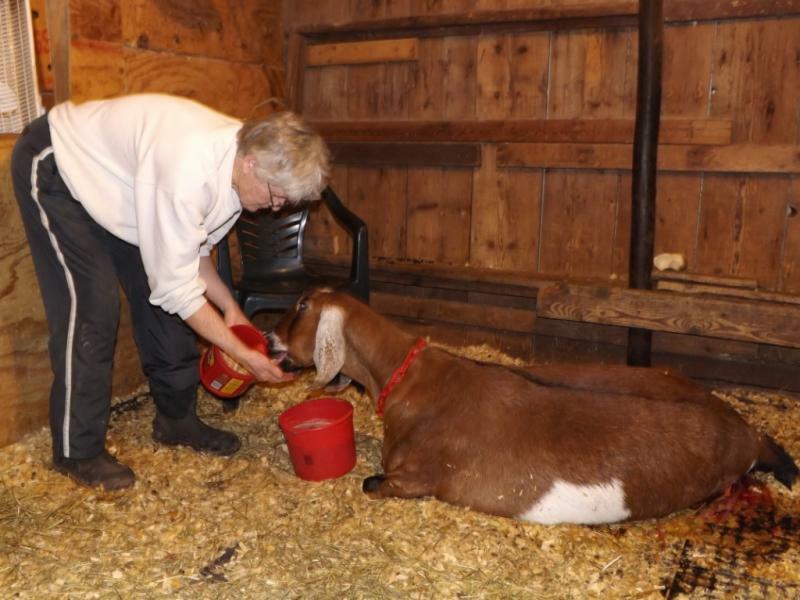 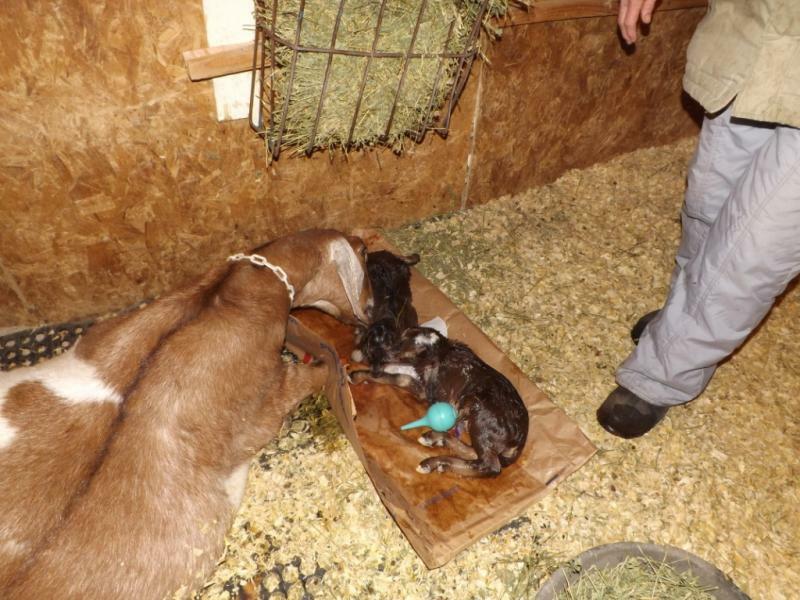 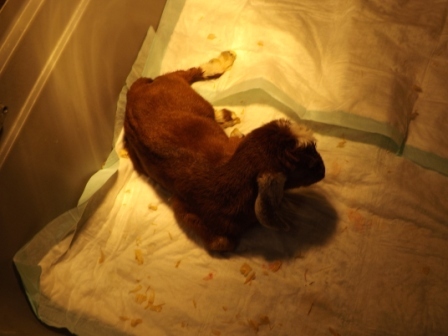 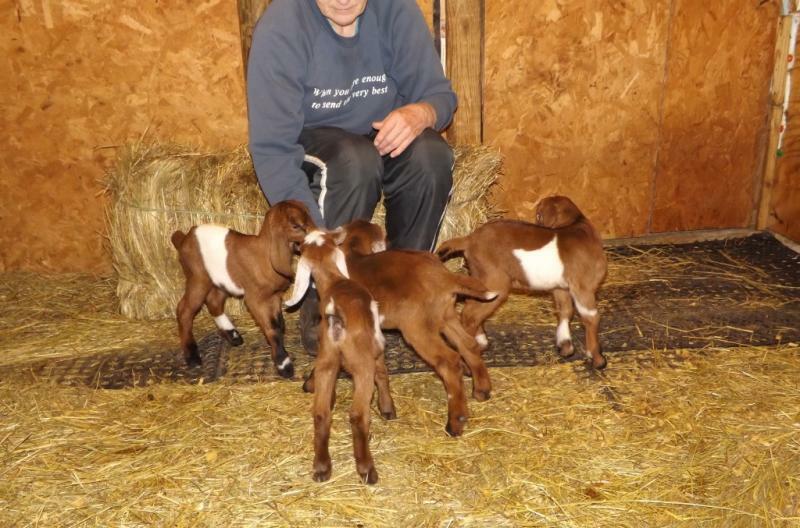 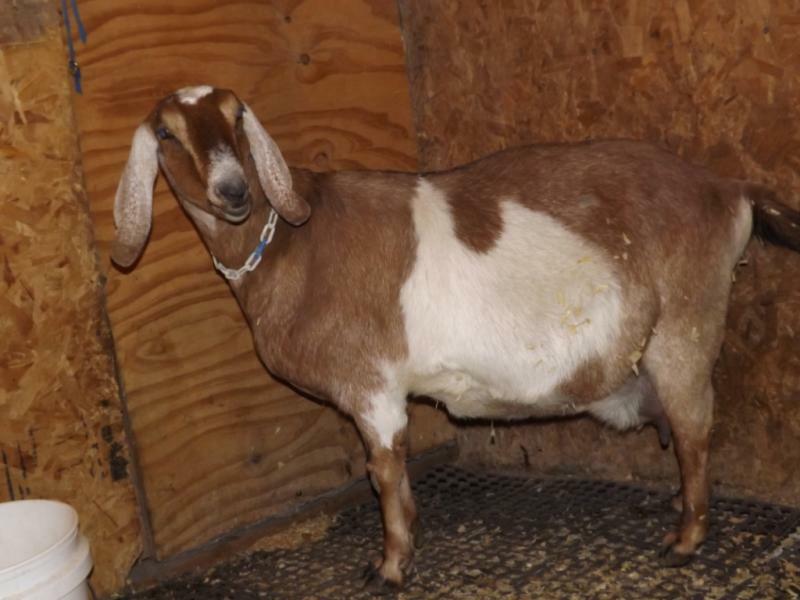 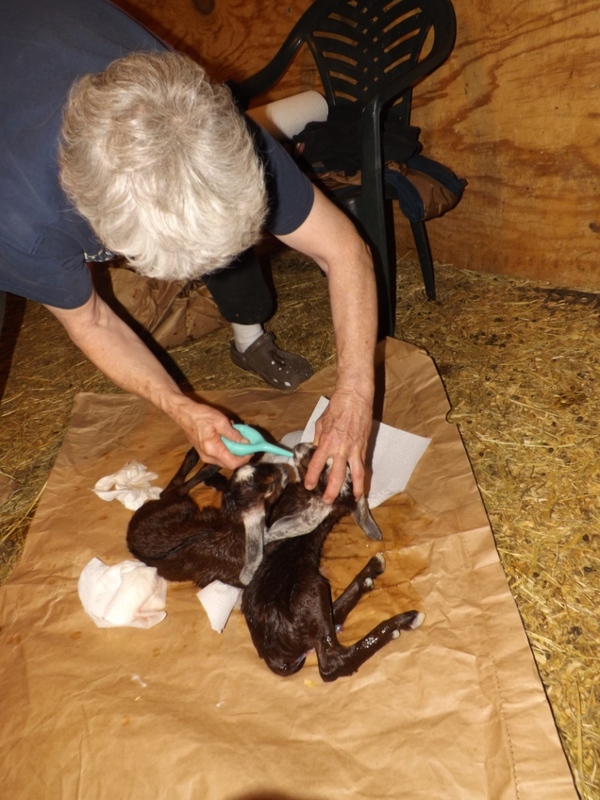 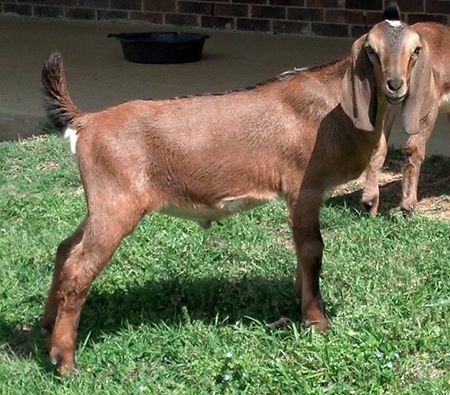 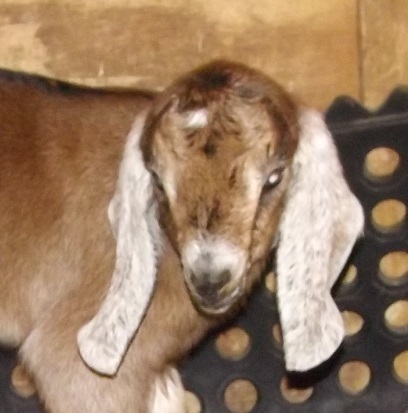 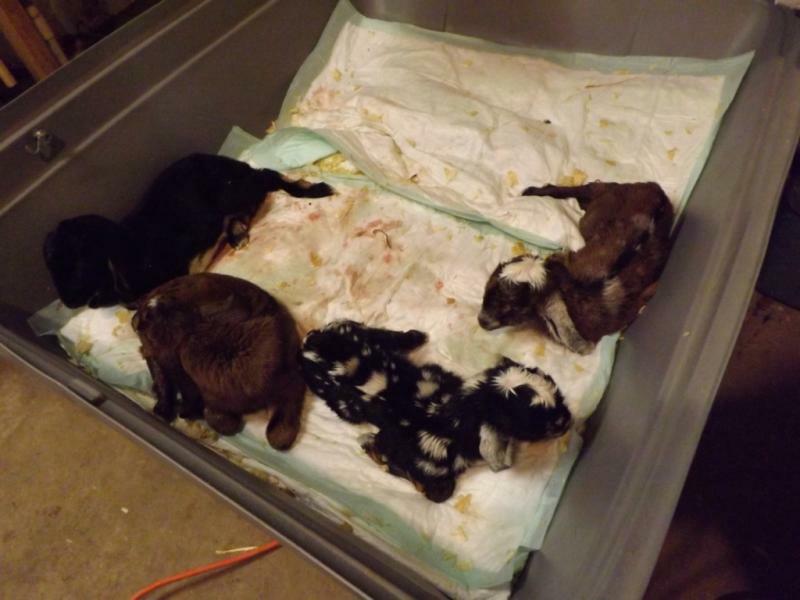 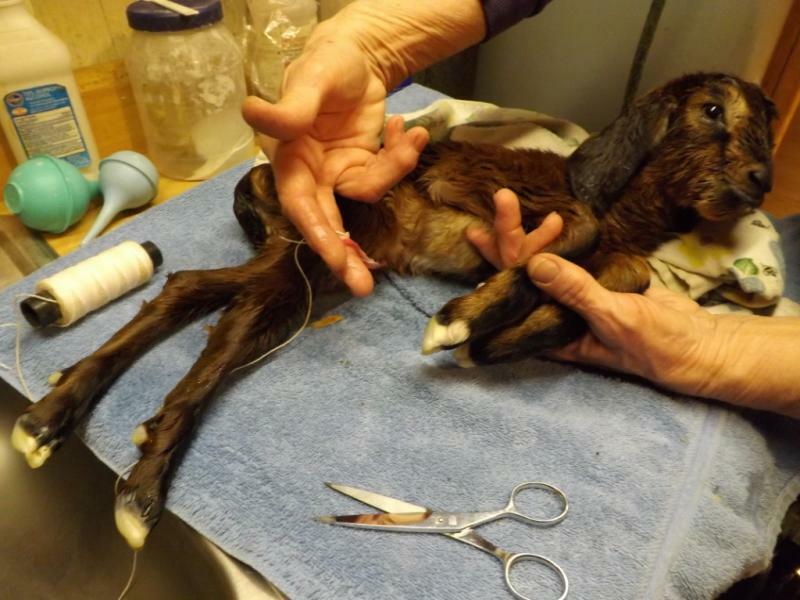 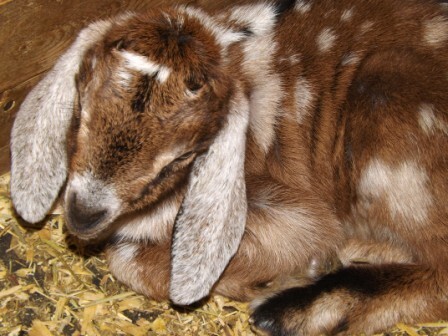 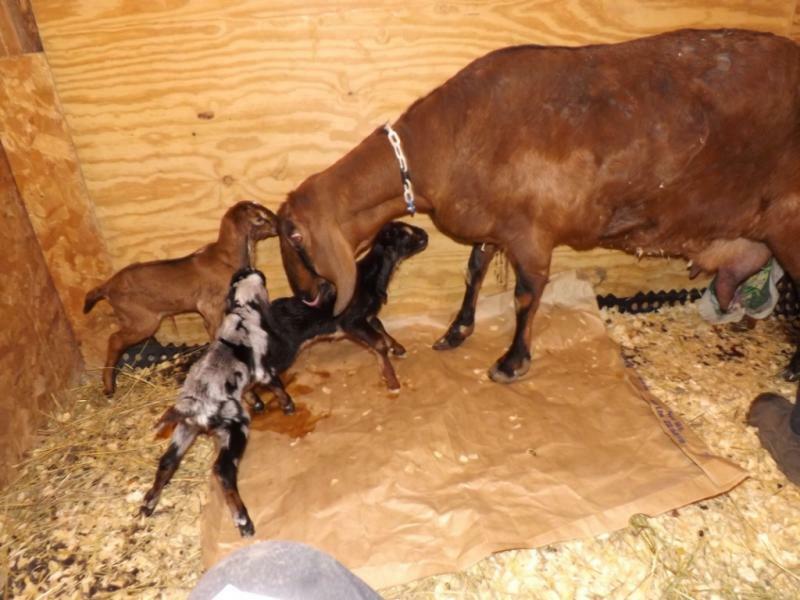 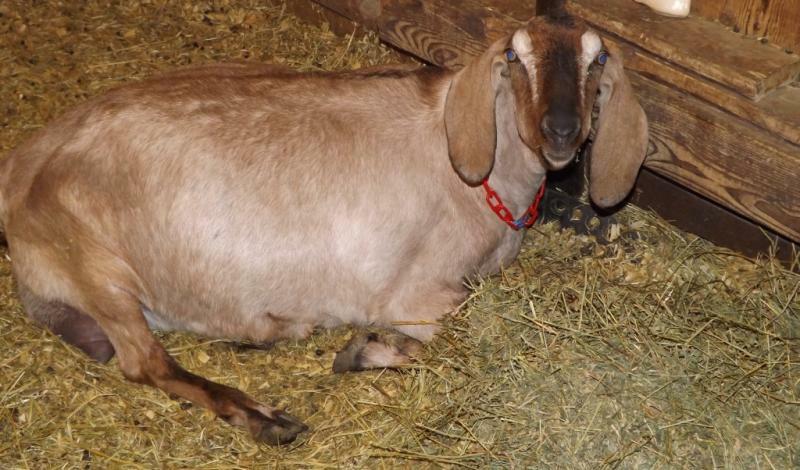 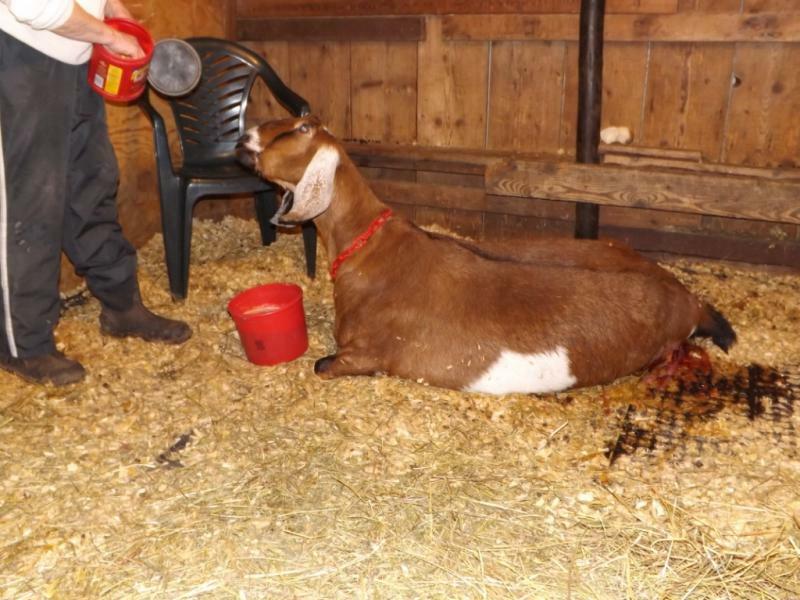 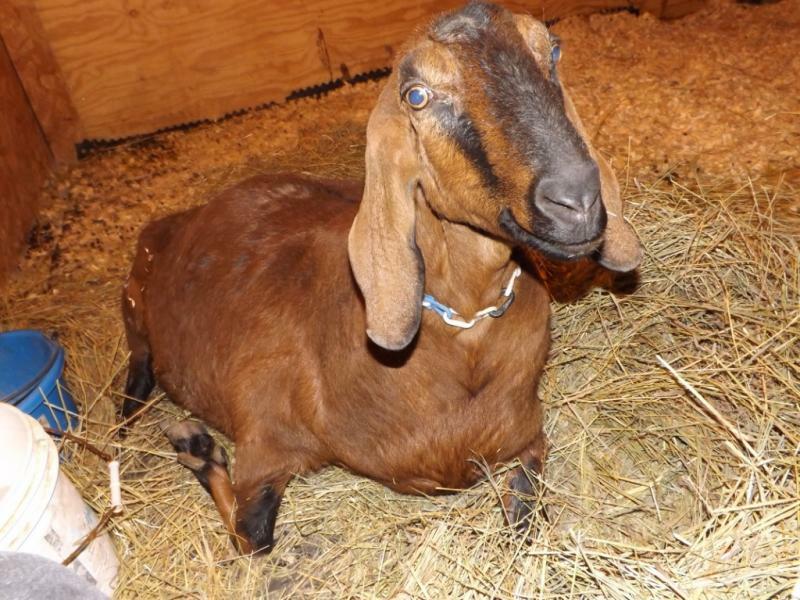 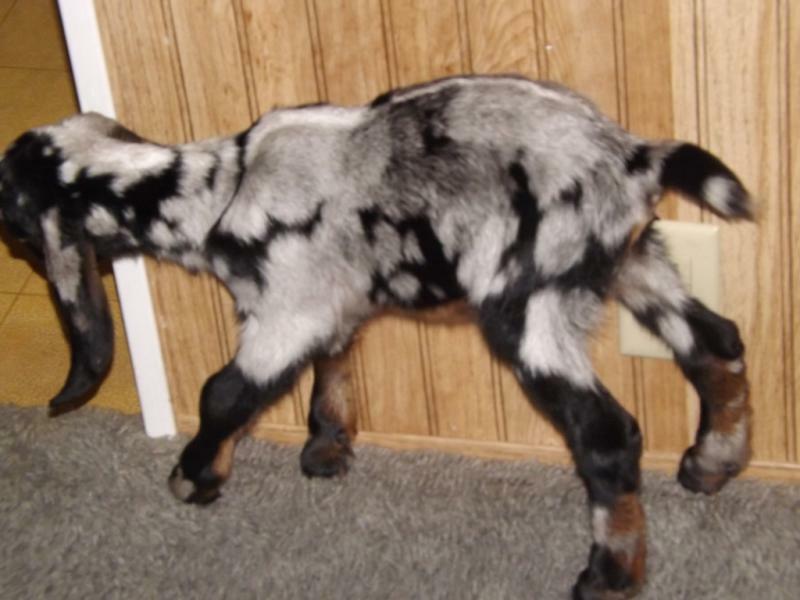 Goddard Farm Pandora, 3*M, Born April 19th., 2007, kidded at 4:00 P.M., Saturday, February 22nd., 2014 with triplets. 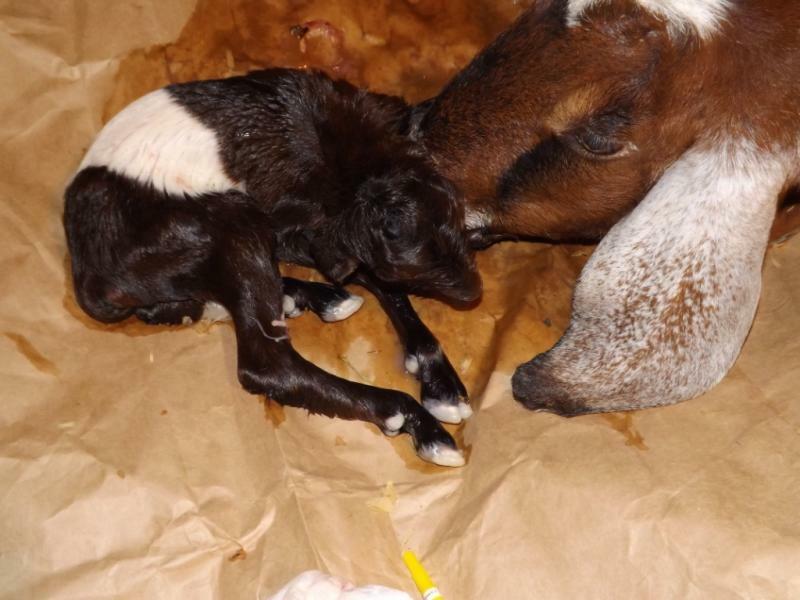 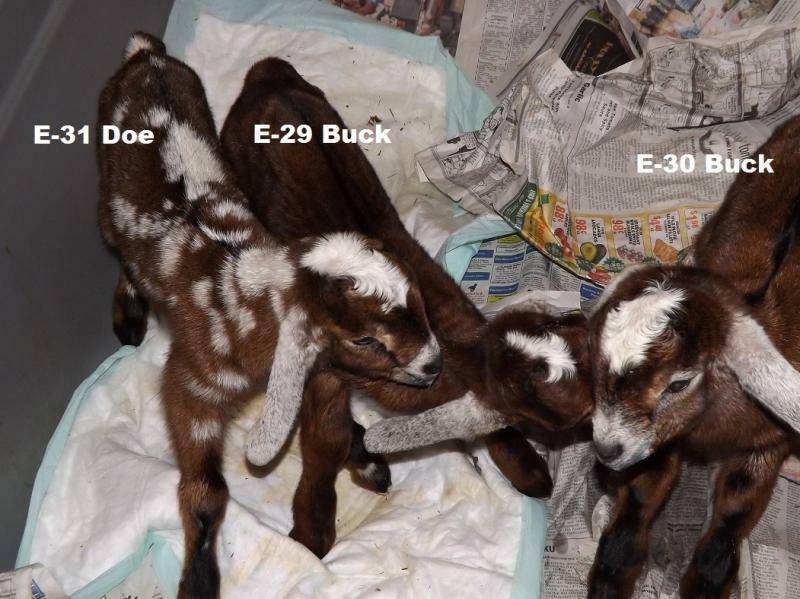 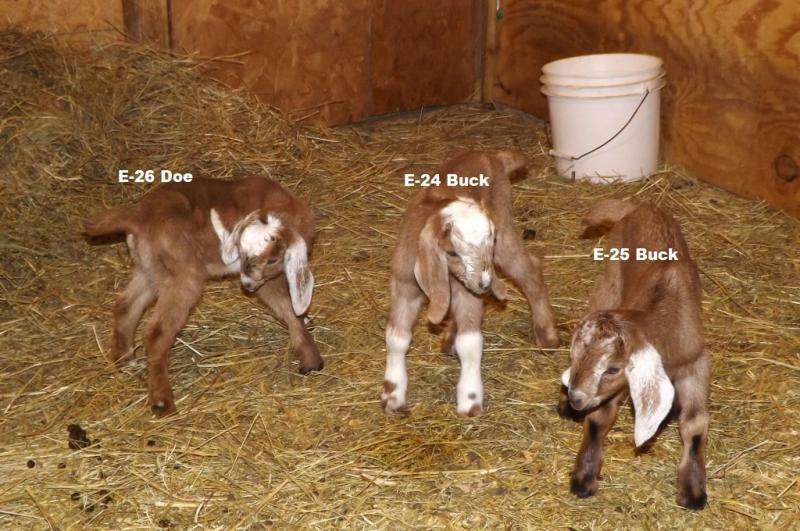 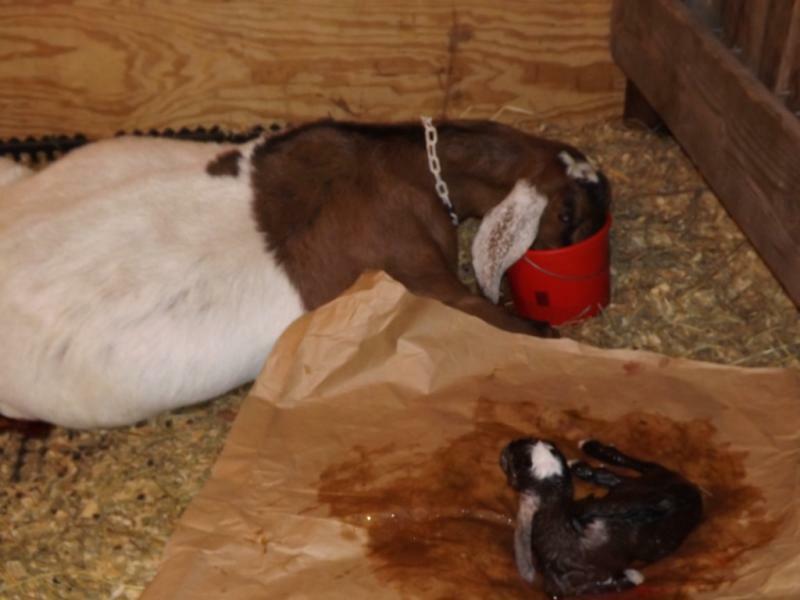 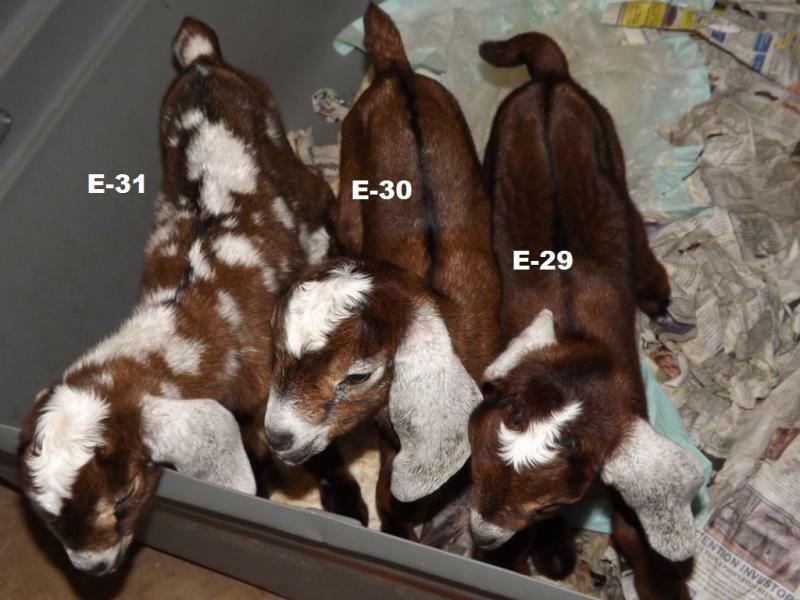 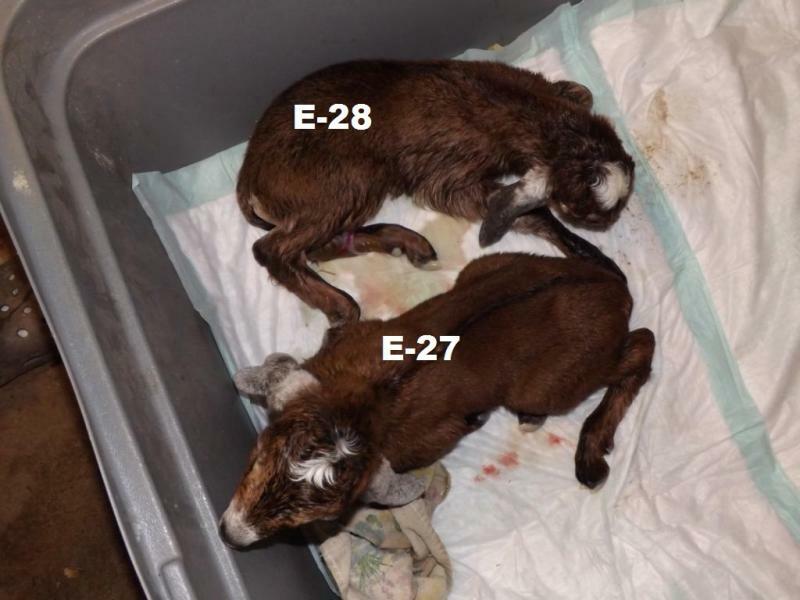 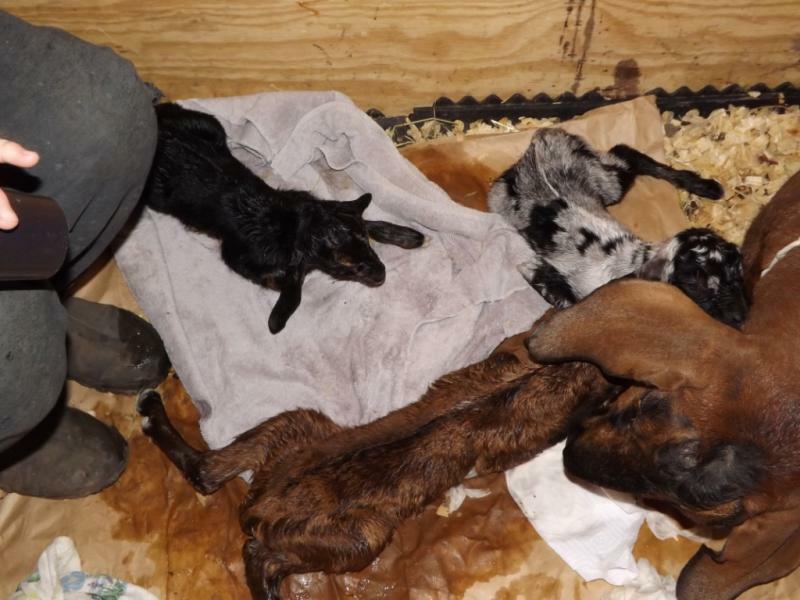 WHAT A DIFFERENCE TWO DAYS MAKES PICTURE 02-24-2014 4:00 P.M.
GODDARD FARM PANDORA, 3*M, E-4 BUCK KID BORN 02-22-2014 AT 4:00 P.M. 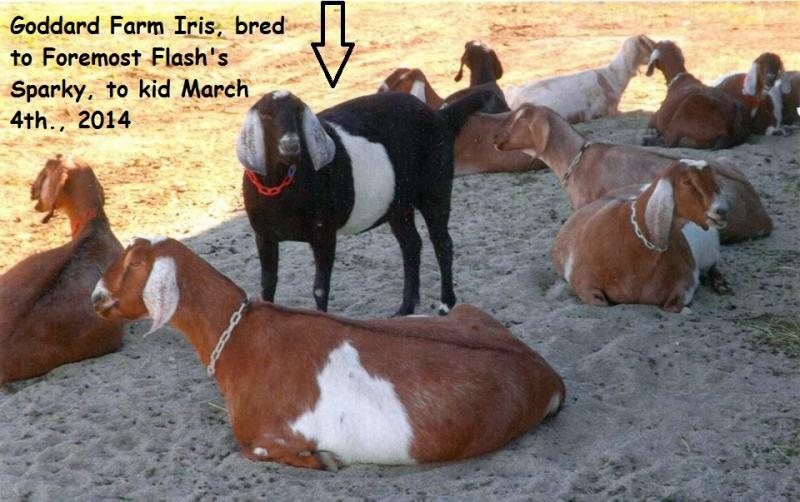 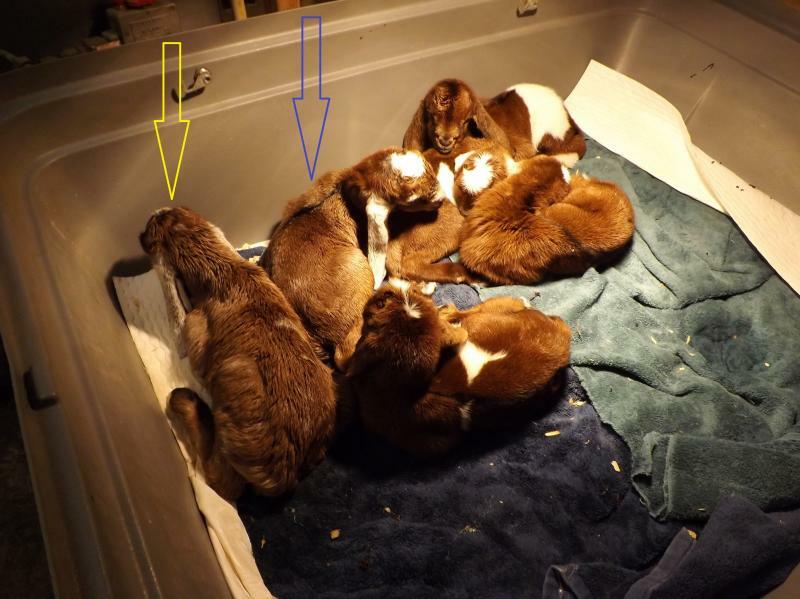 THE YELLOW ARROW POINTS TO IRIS' DOE KID & THE BLUE ARROW POINTS TO HER BUCK KID. 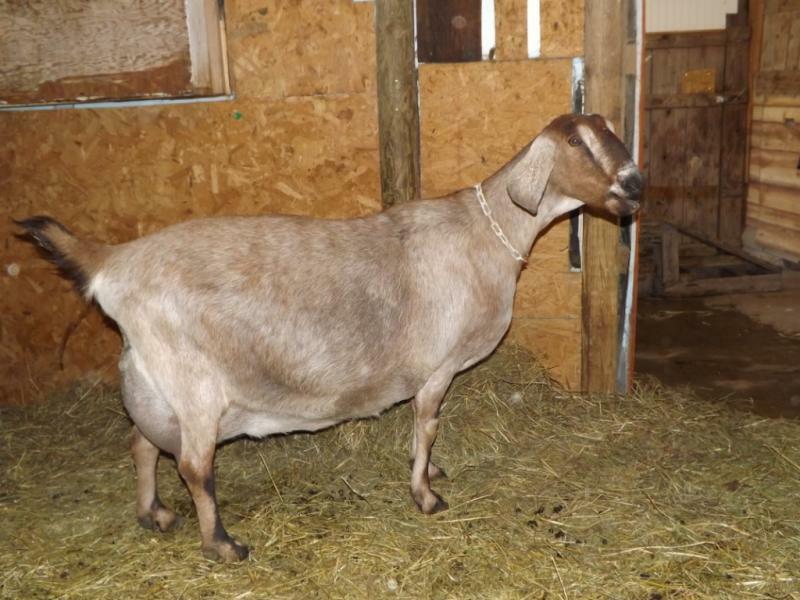 If you like power, strength, brisket, depth of heart, top lines, length, width, dairy character, the genetic ability to show & milk, you will like this doe & her kids. 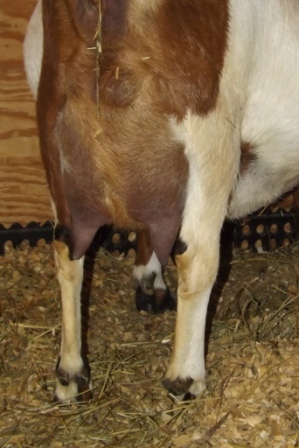 High tight well attached rear udder. 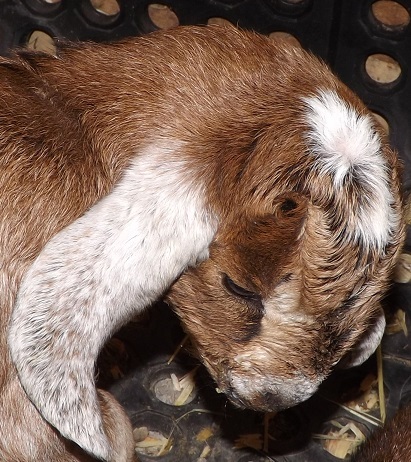 E-17 OLALLIEBERRY'S SECOND BORN BUCK KID ALL DRIED OFF AT 2:30 P.M. ON MARCH 19TH., 2014 AND FULL OF COLOSTRUM READY FOR HIS NAP. 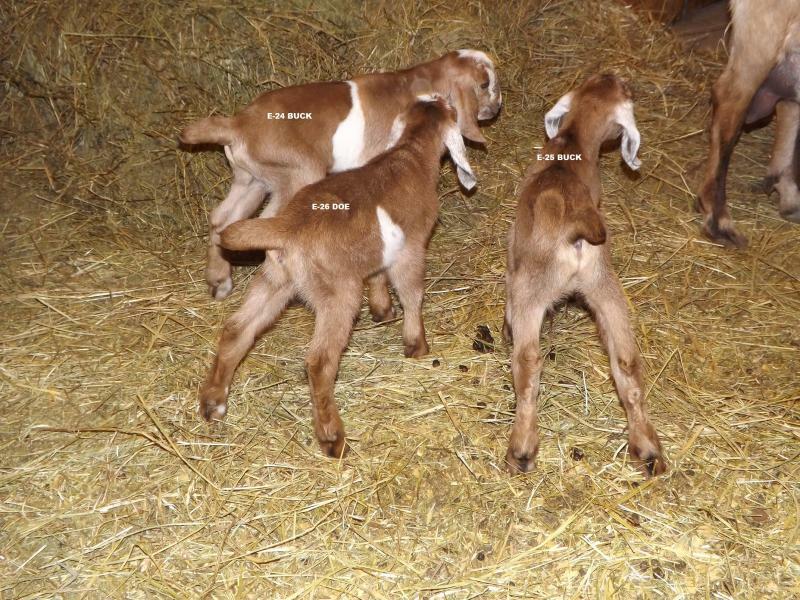 FIRST BORN - TAN KID (E-16) ON THE LEFT, SECOND BORN E-17 - DARK BROWN KID ON THE RIGHT. 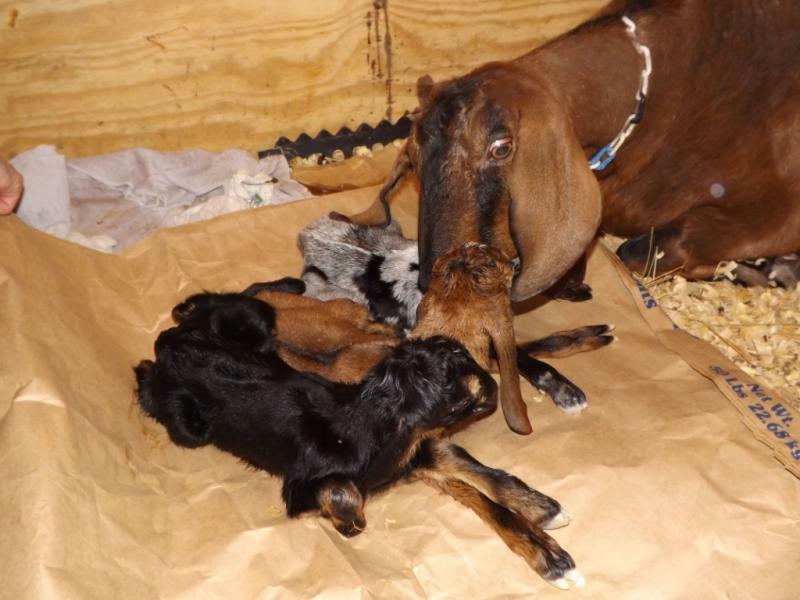 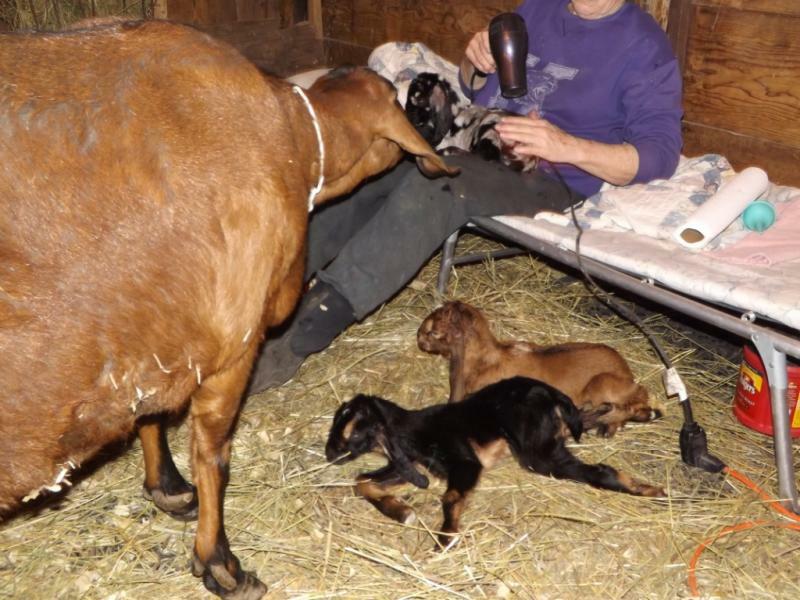 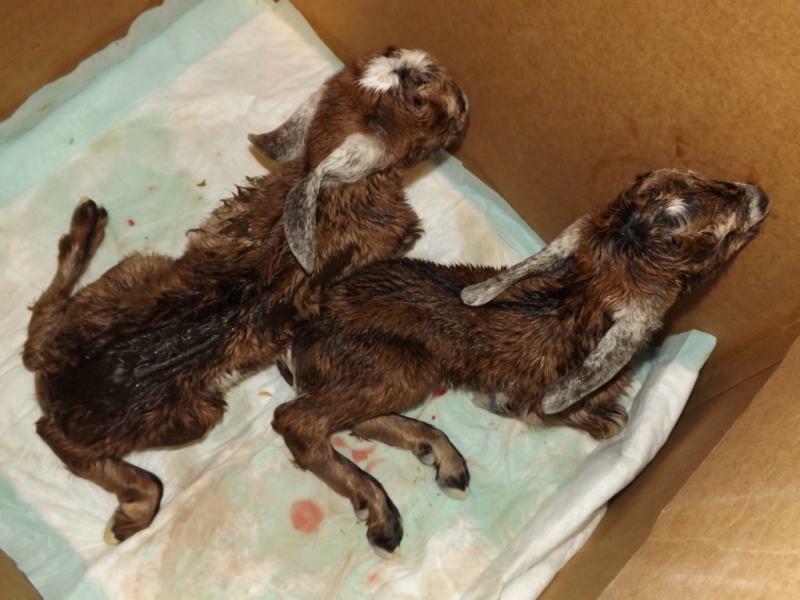 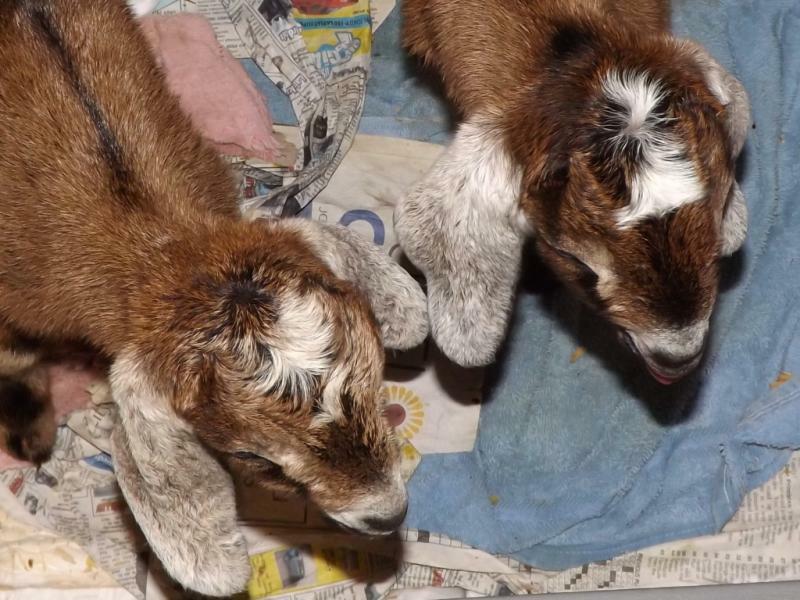 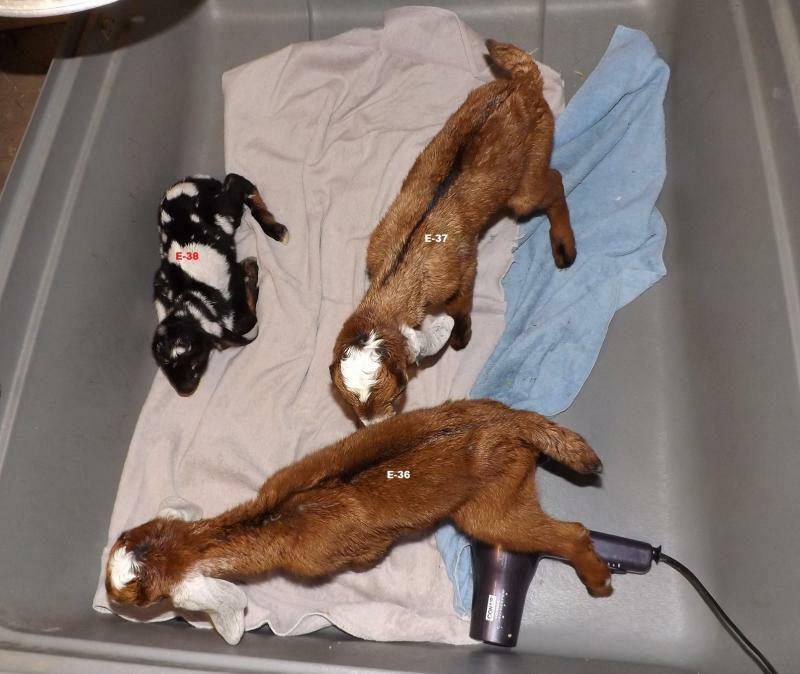 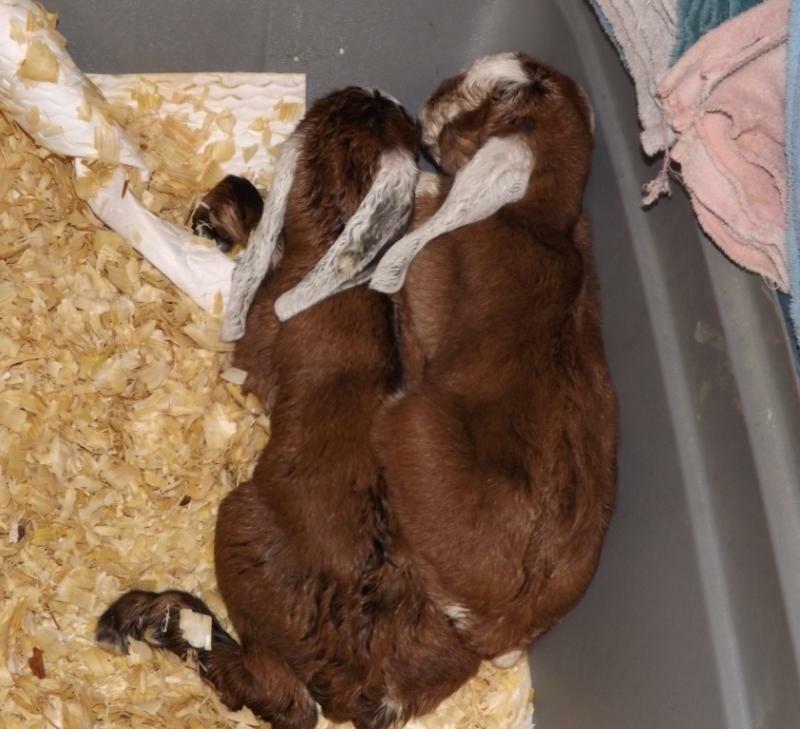 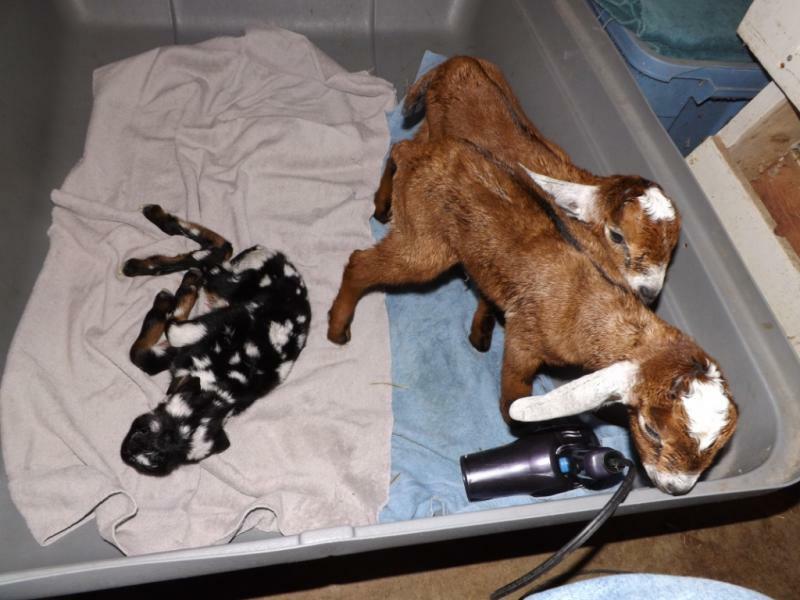 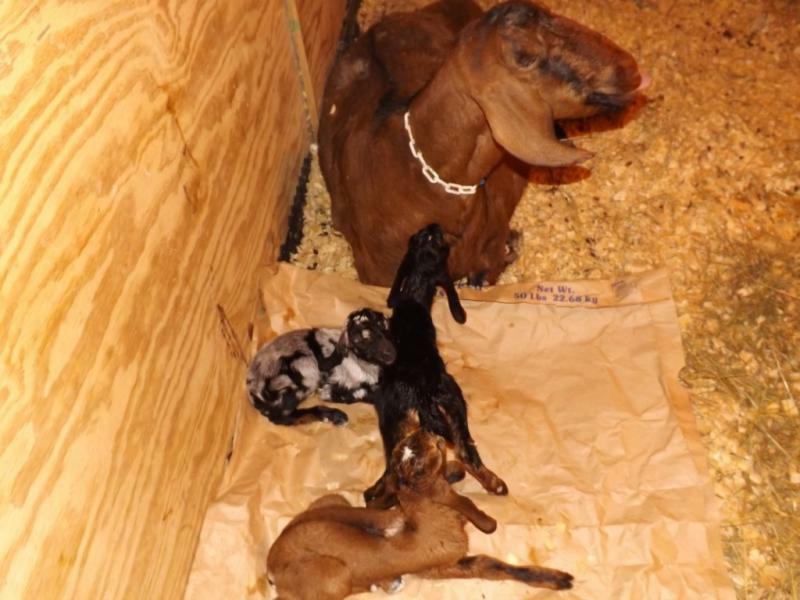 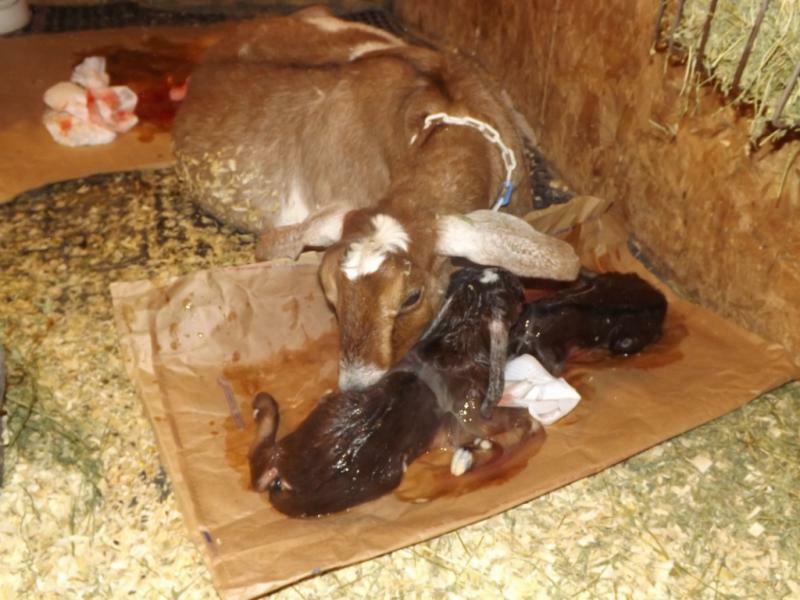 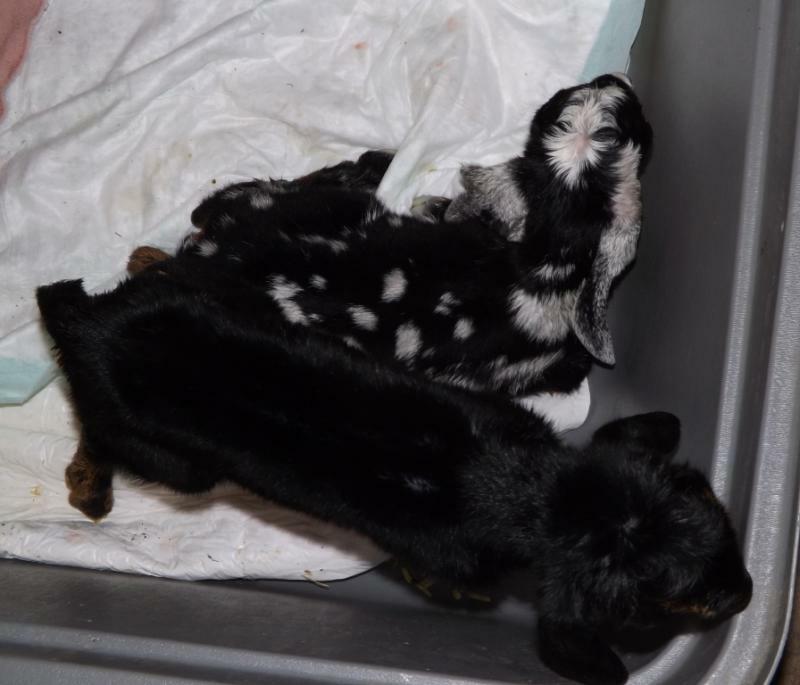 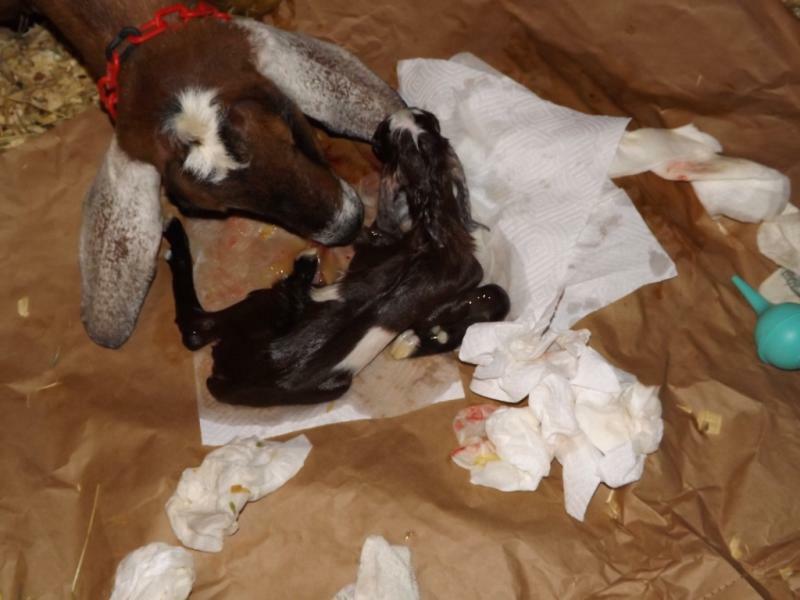 PENNY'S TWINS BORN 11:00 A.M.